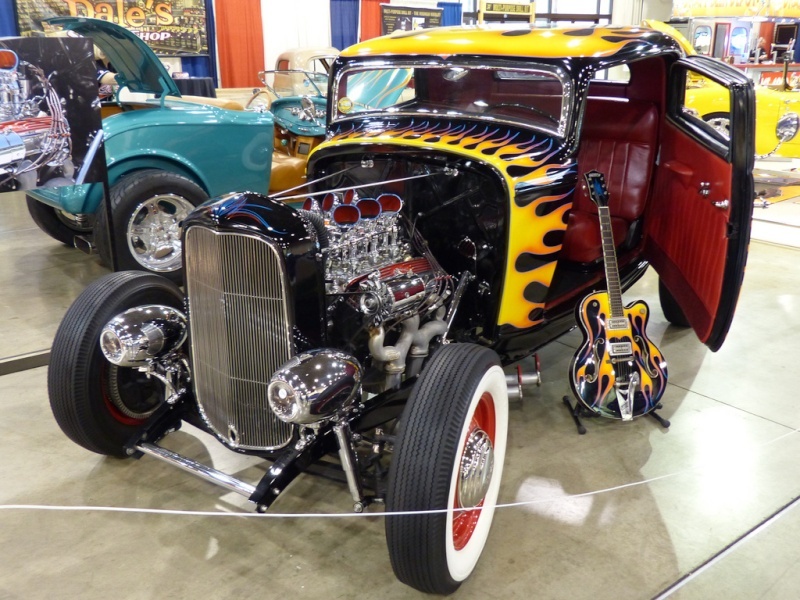 Steve Hough’s Deuce had all the right traditional elements, including a ’52 Flathead with Offy heads, split bones, chopped windshield, and deep blue vibe. 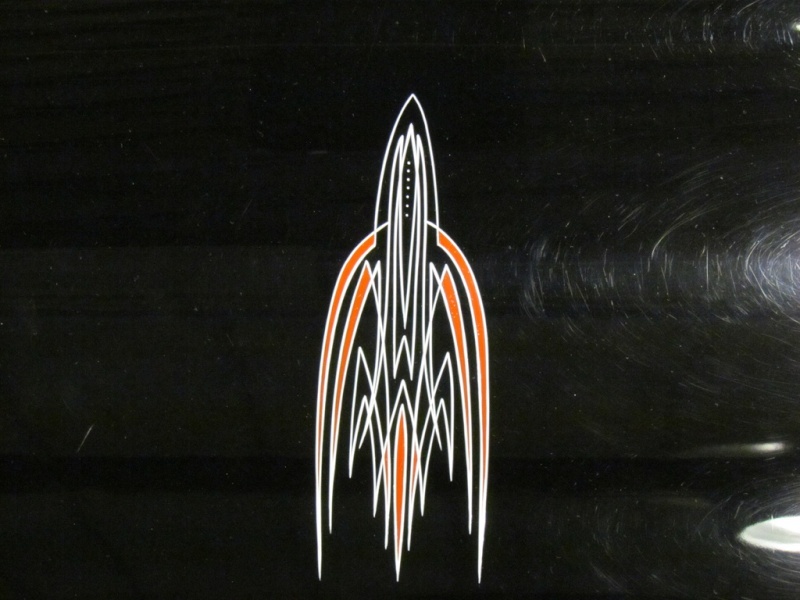 Je vois là un 33/34! 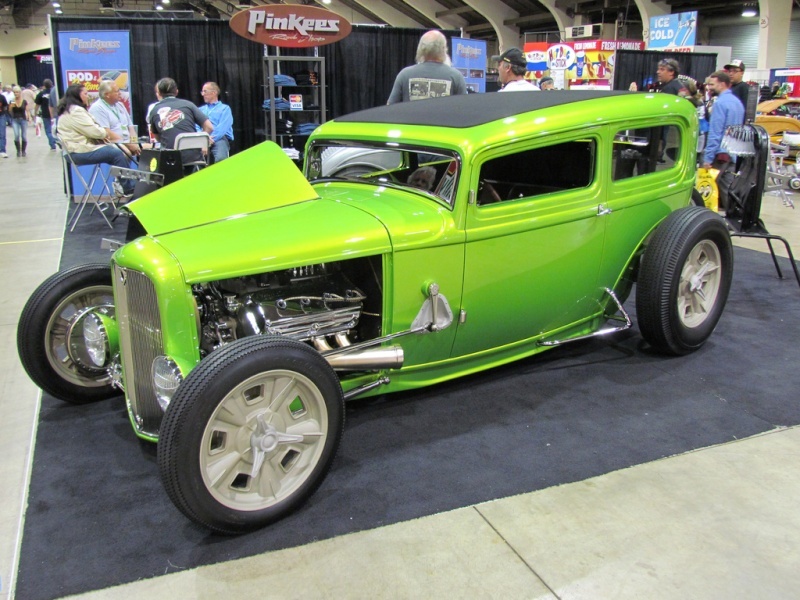 *Candy Tangerine with Lime Gold Flames! 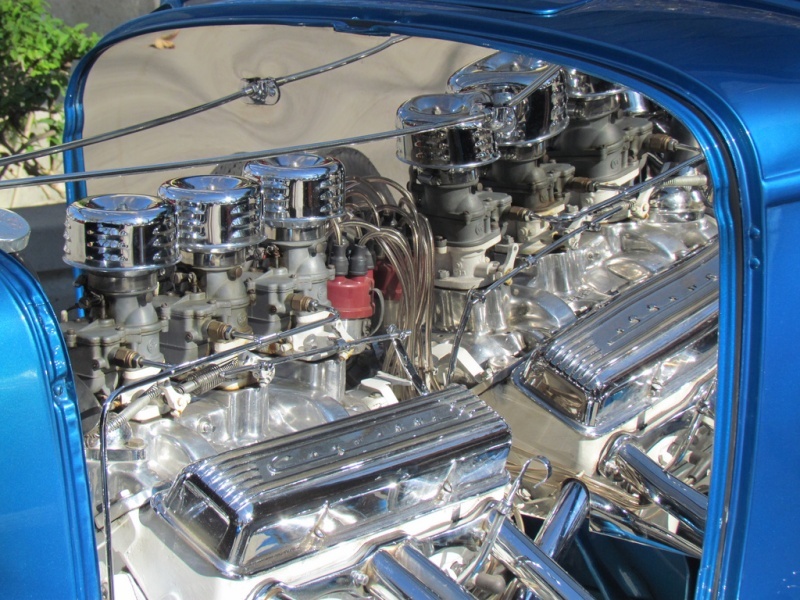 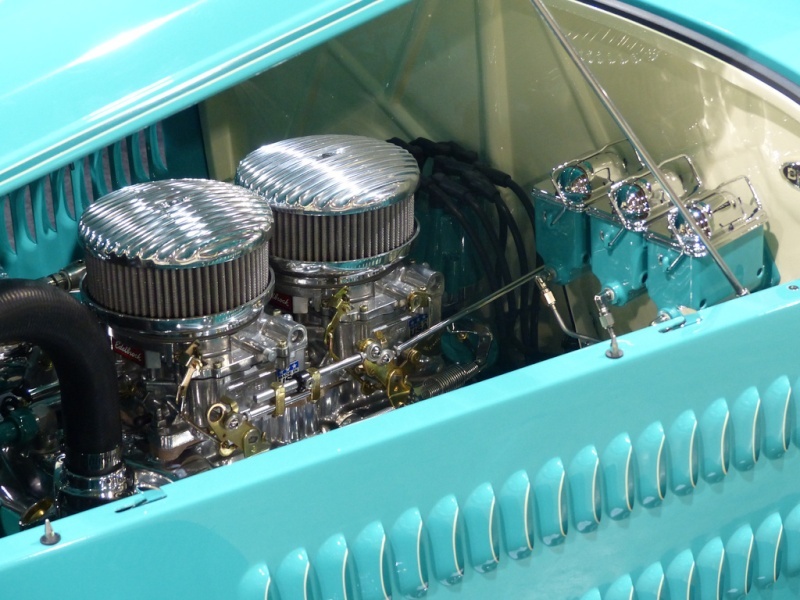 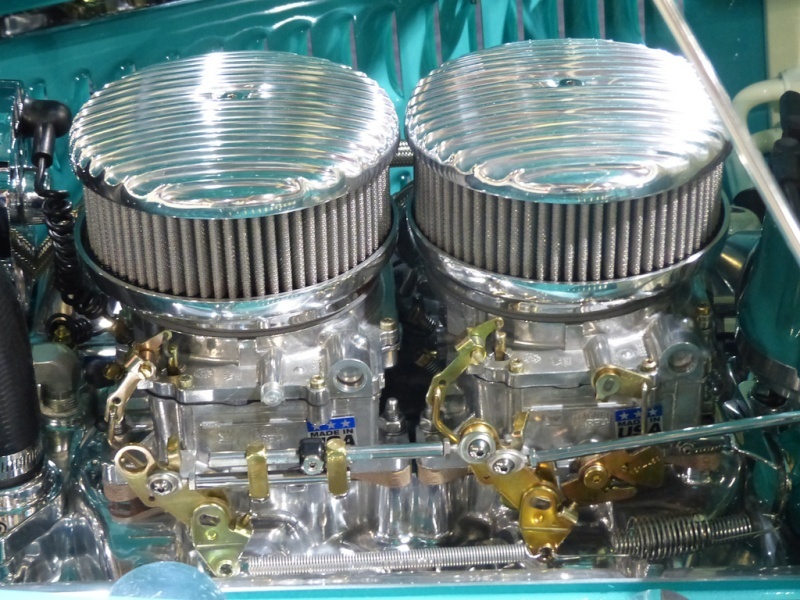 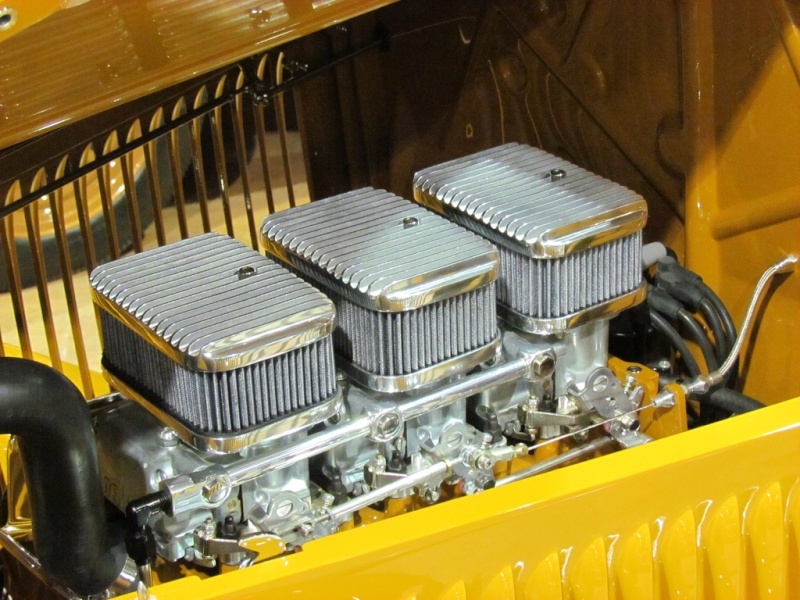 *327 Chevy with 3 Rochester carburetors. 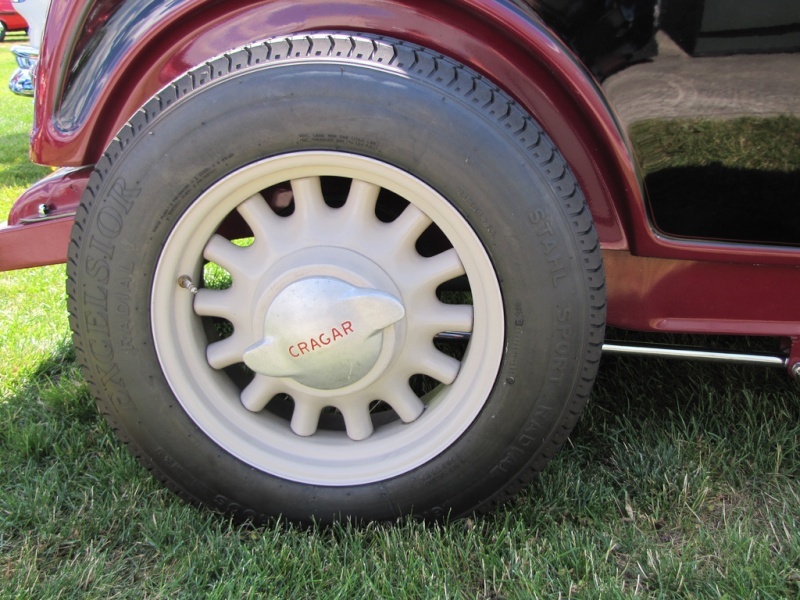 *Buick steel drum disc brakes. 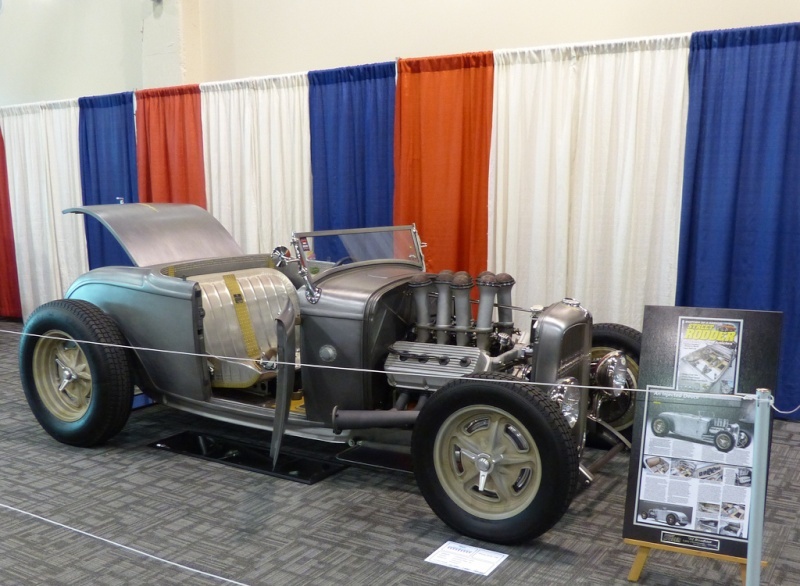 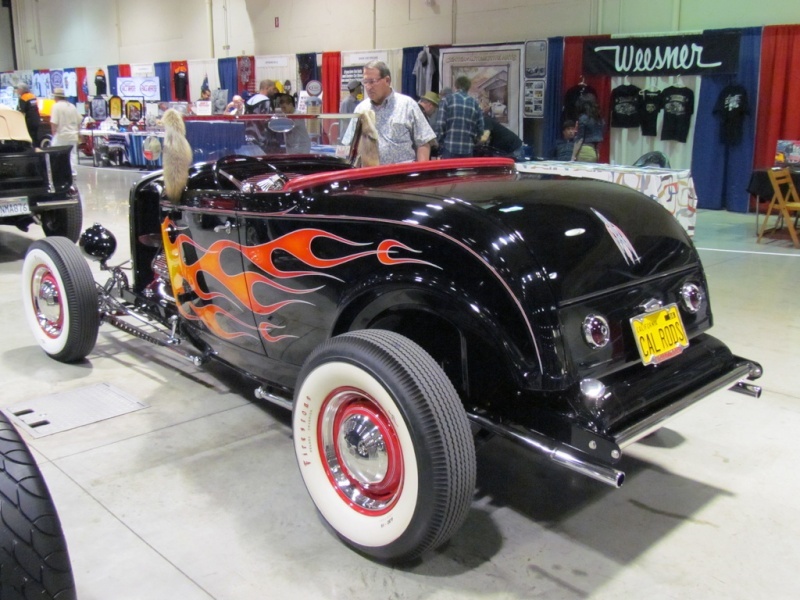 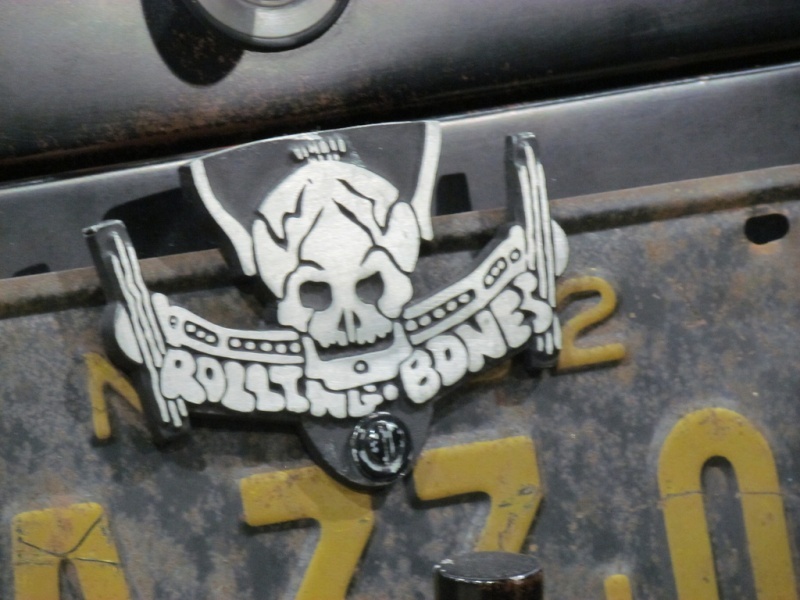 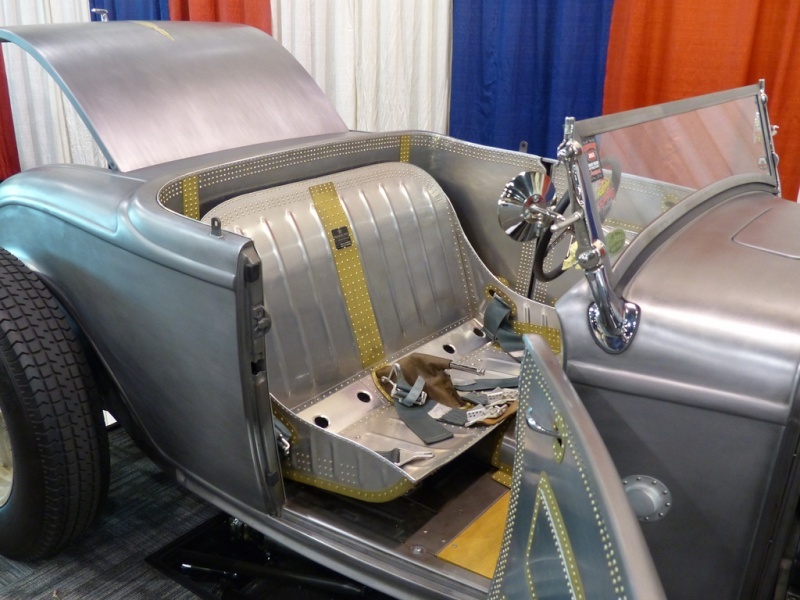 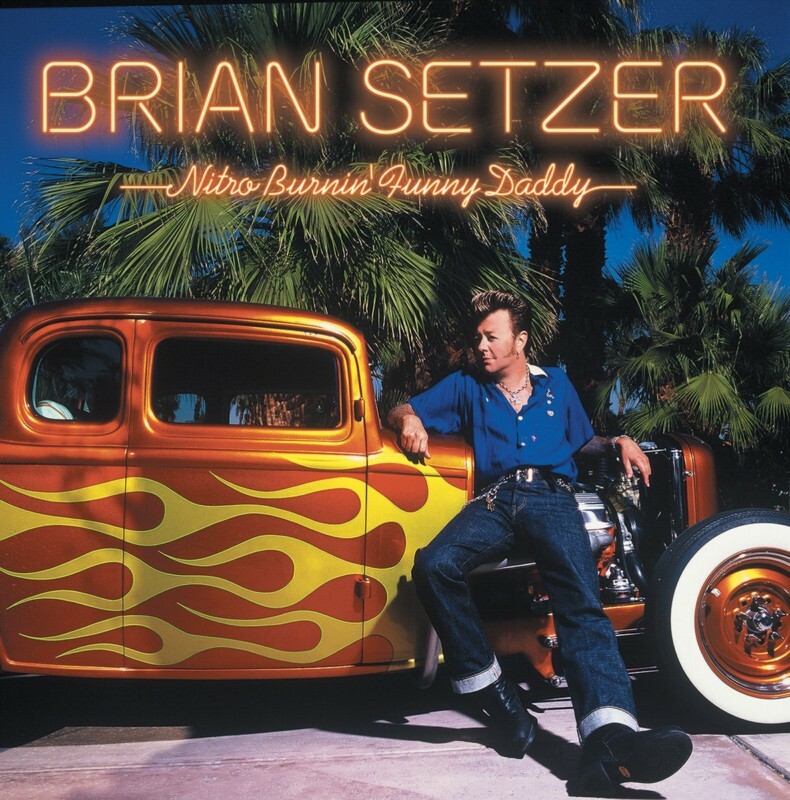 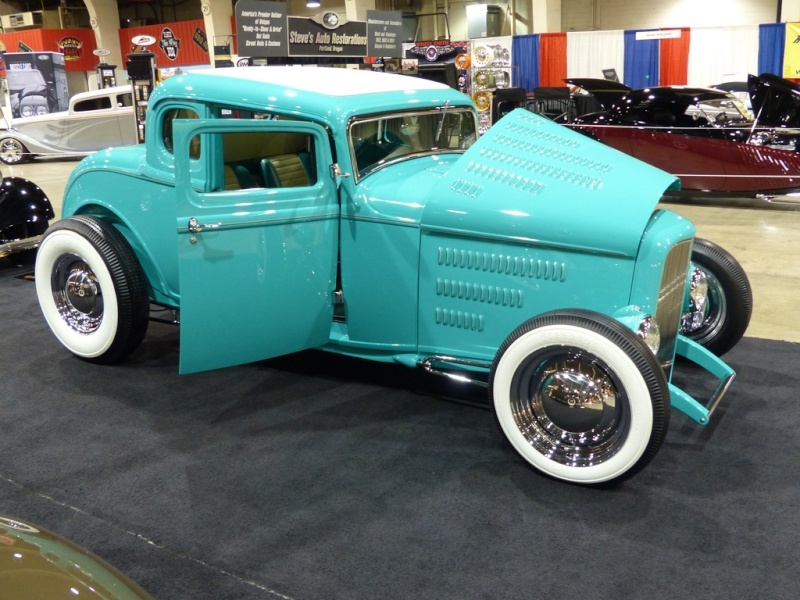 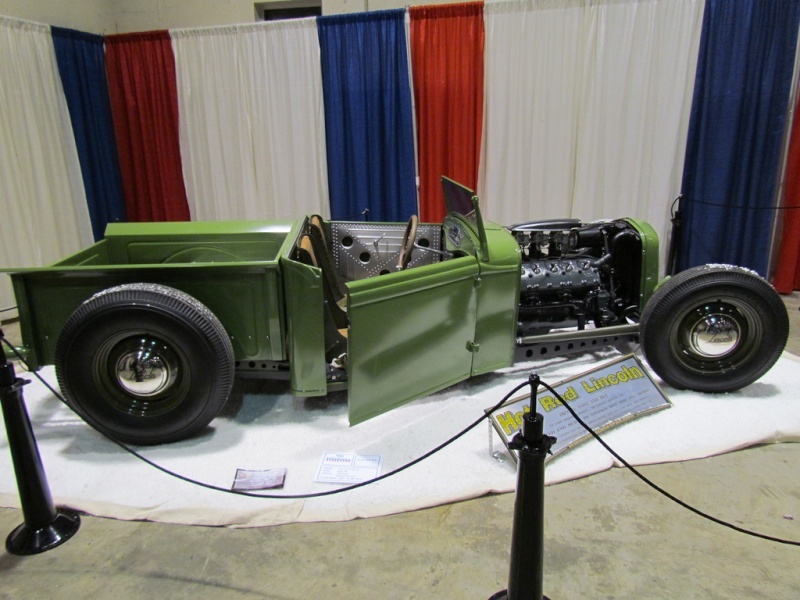 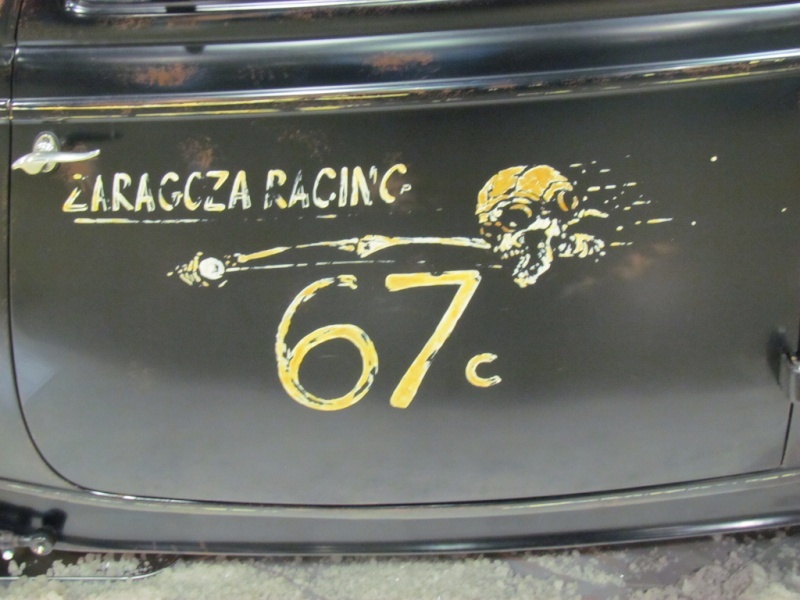 This car was built by Jim Hayes and Brian Setzer over 15 years ago. 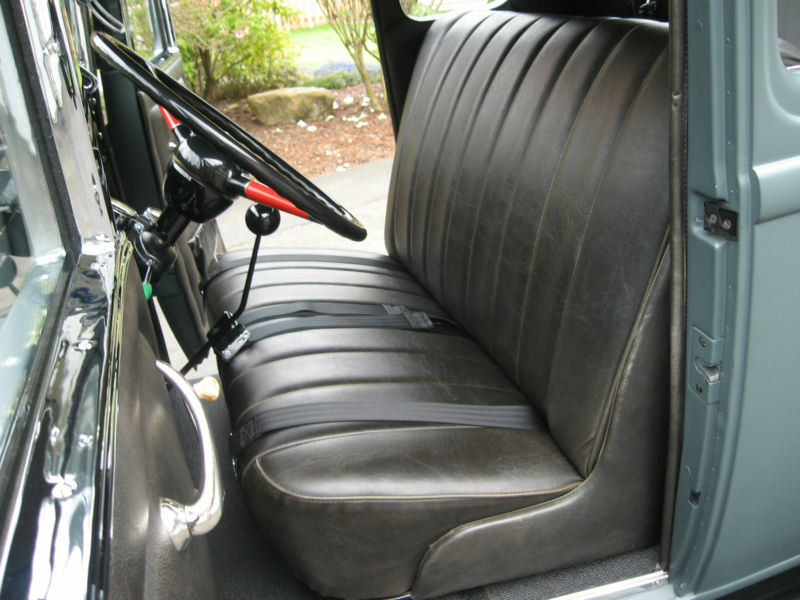 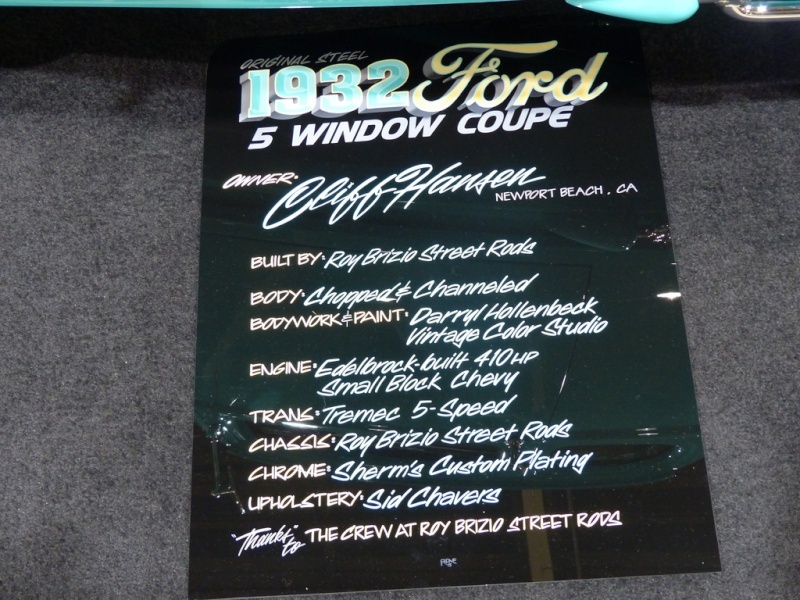 It is one of the very few Henry Ford five window steel bodies on the market today. 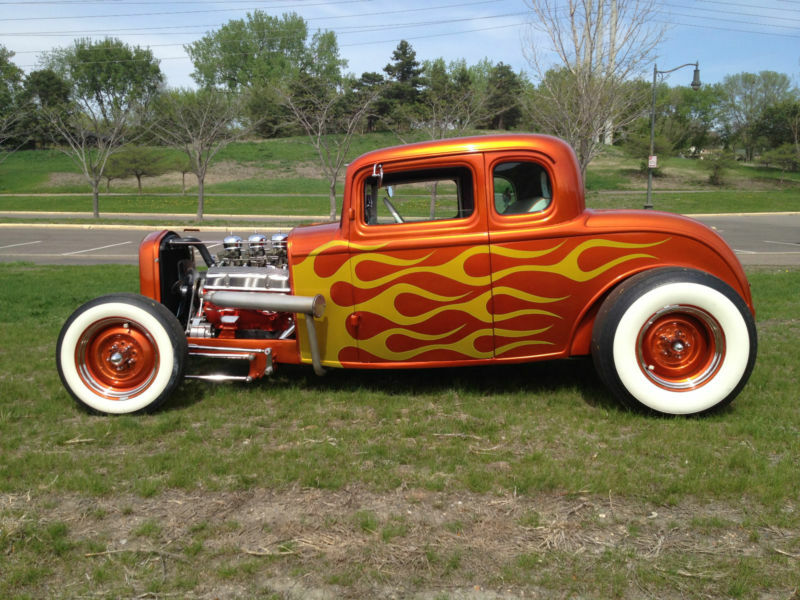 It has all the good 50's gear on it. 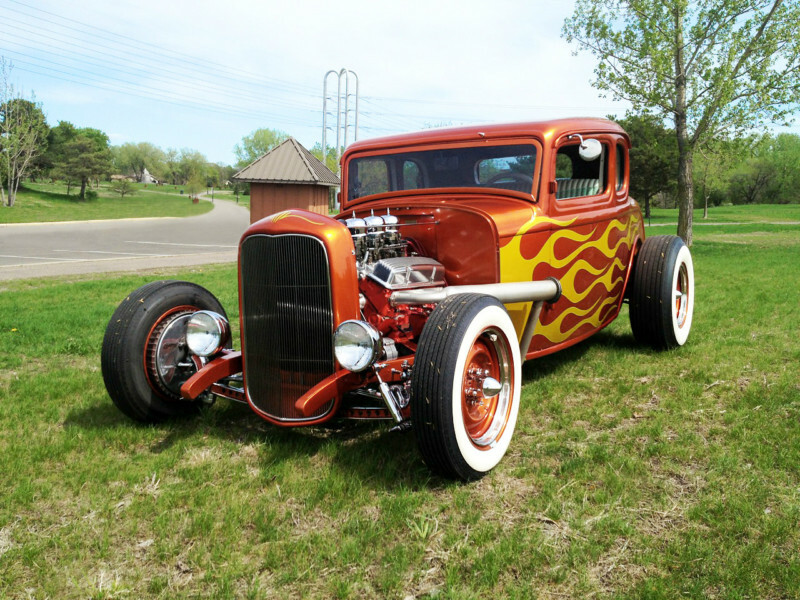 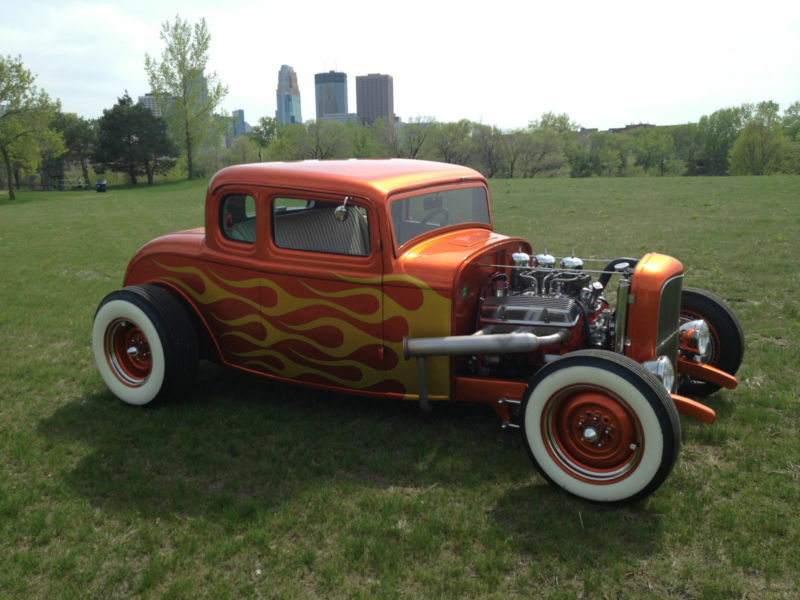 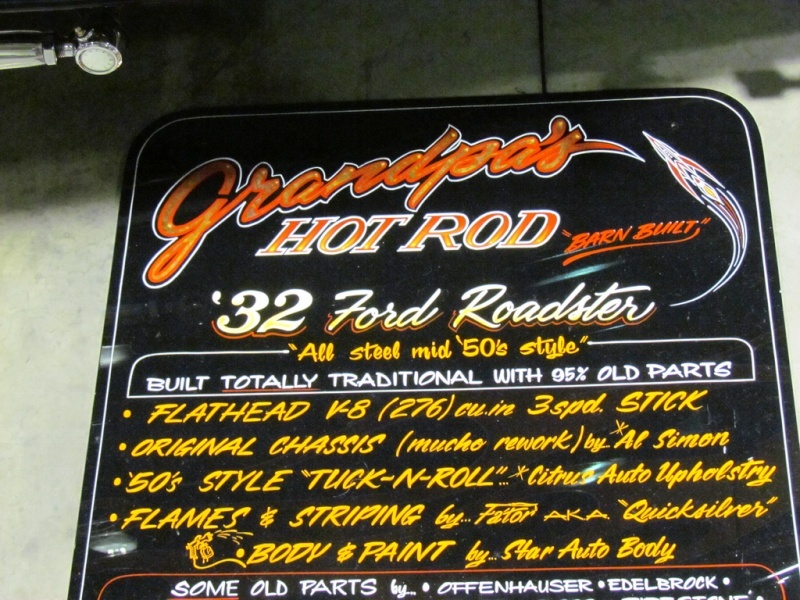 This is a turn-key, no problem, famous hot rod! 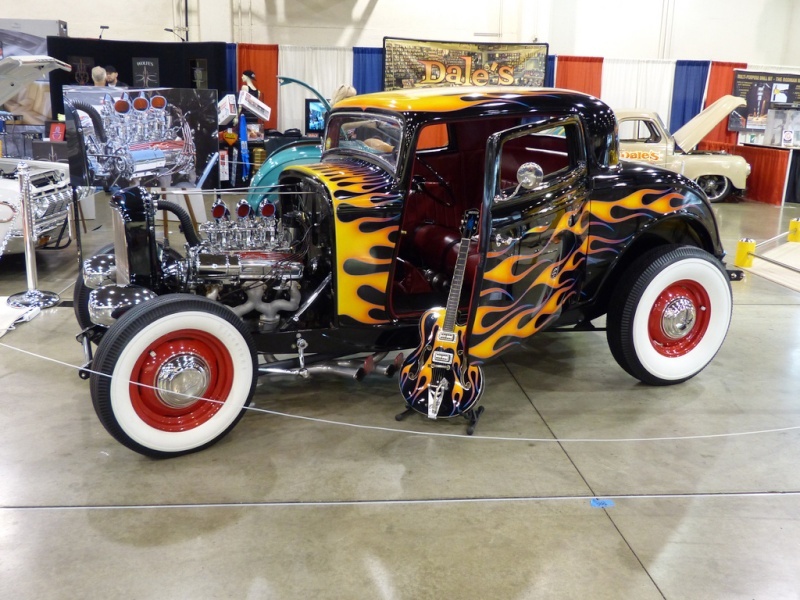 Very few out there as cool as this!! 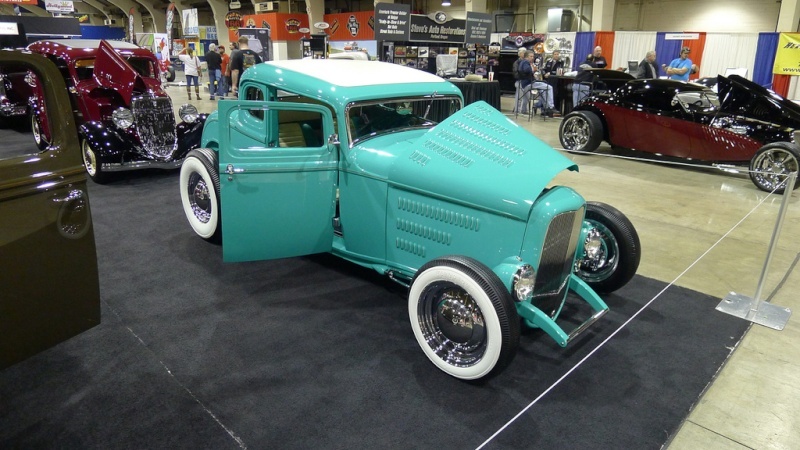 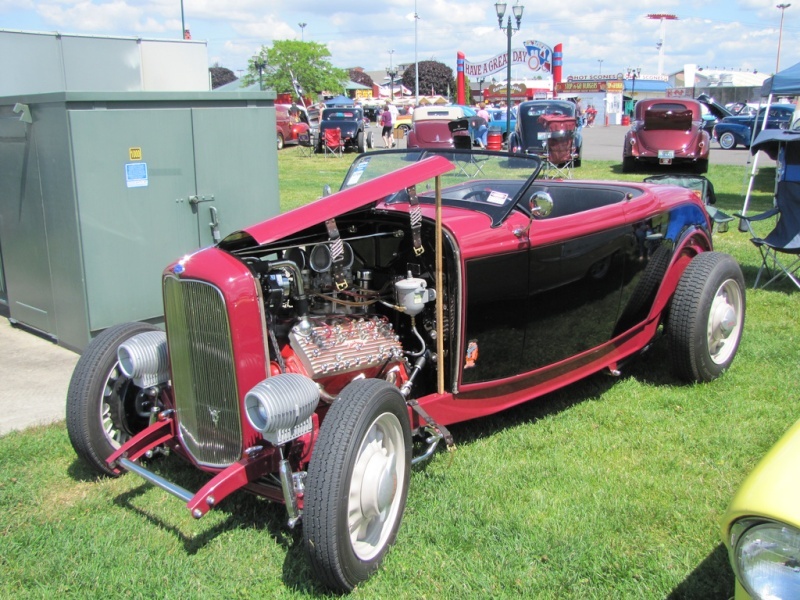 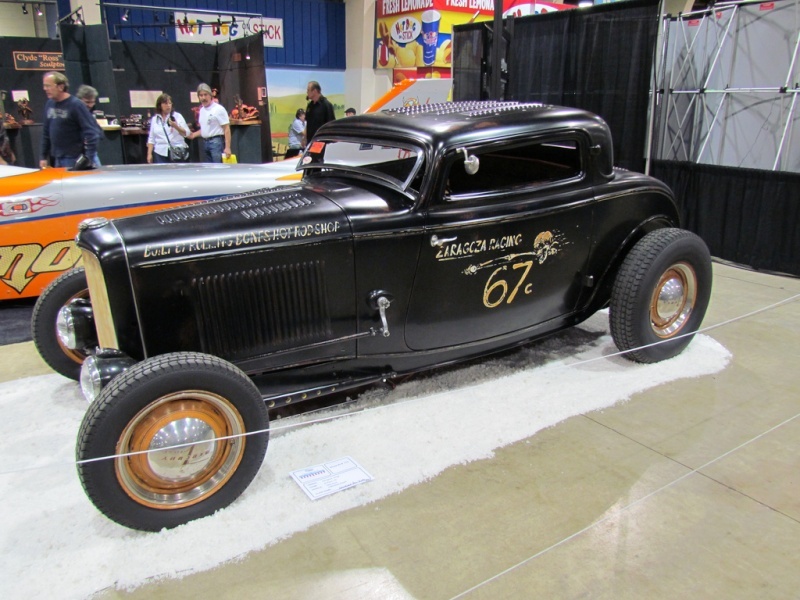 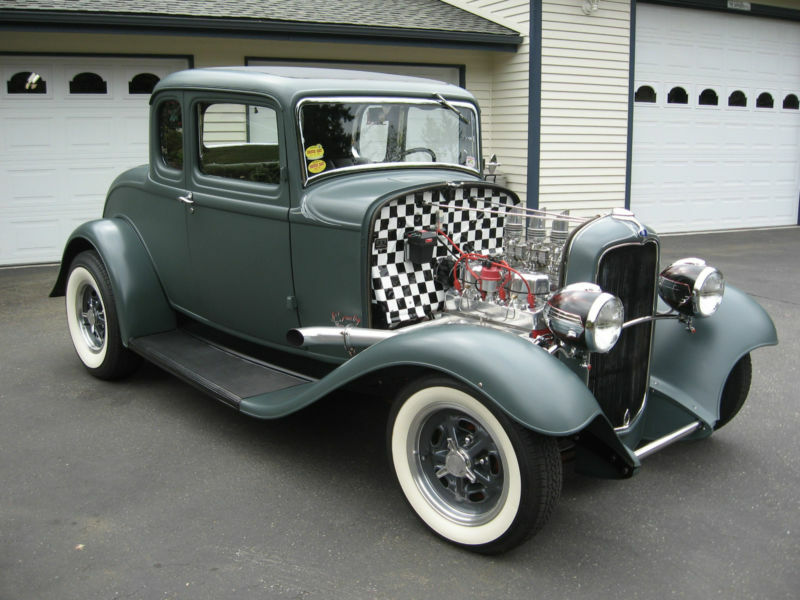 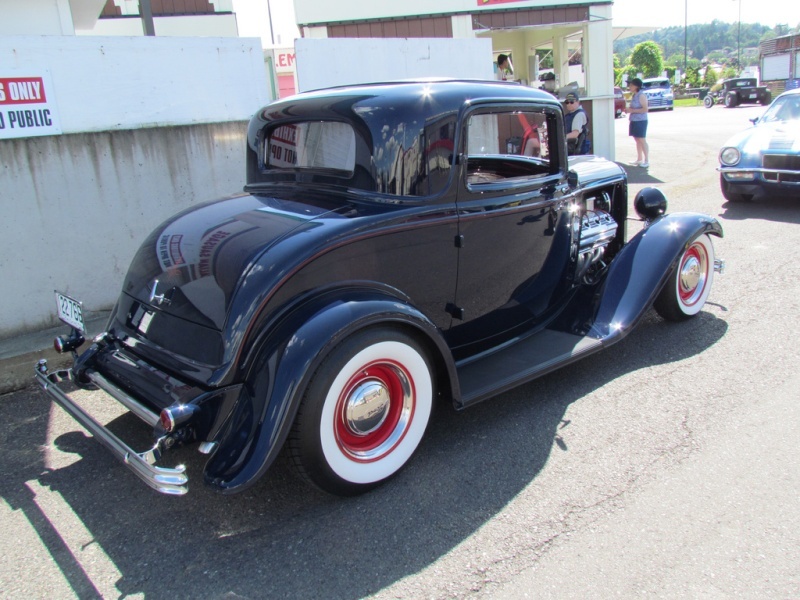 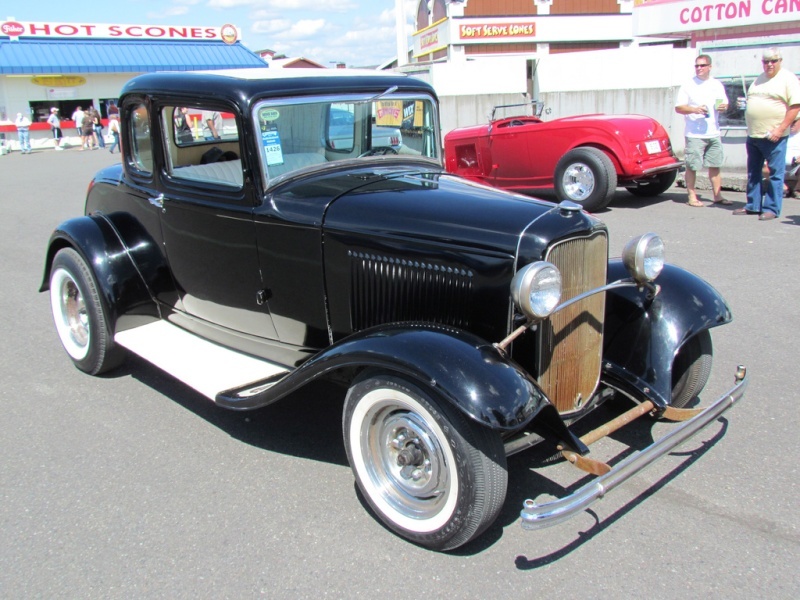 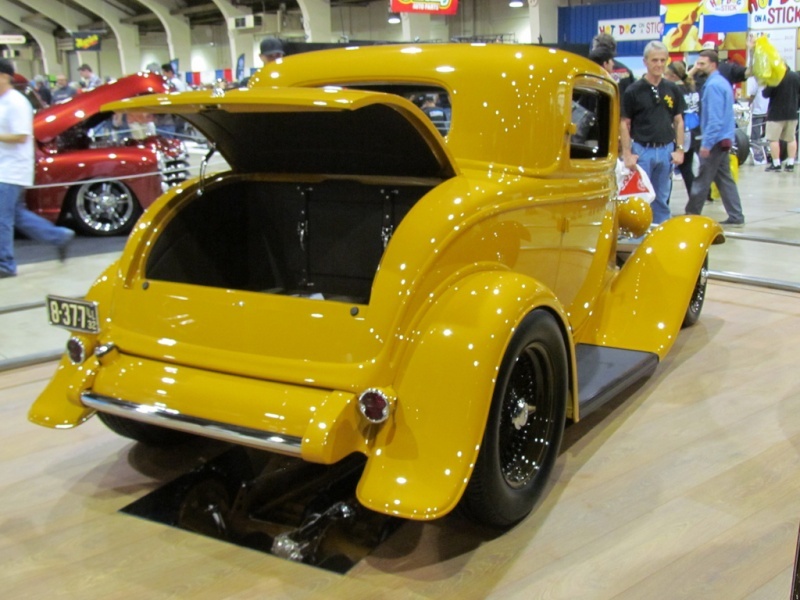 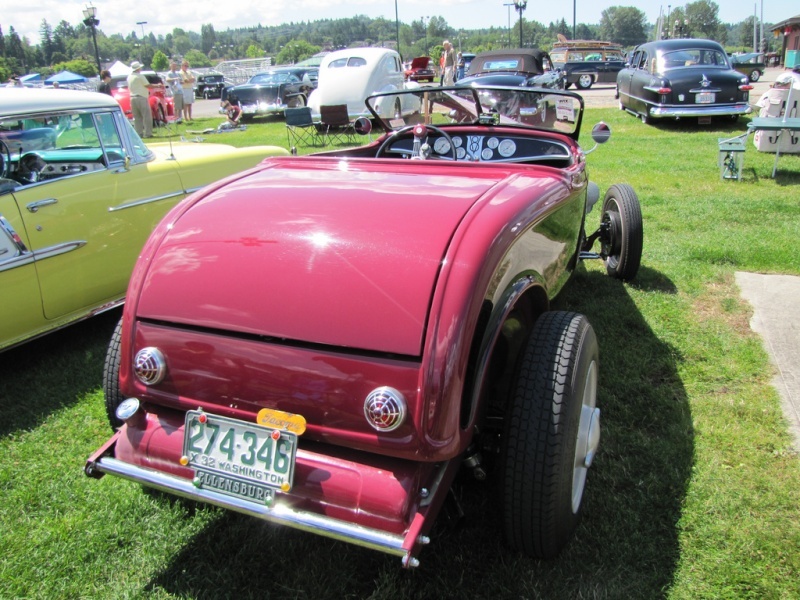 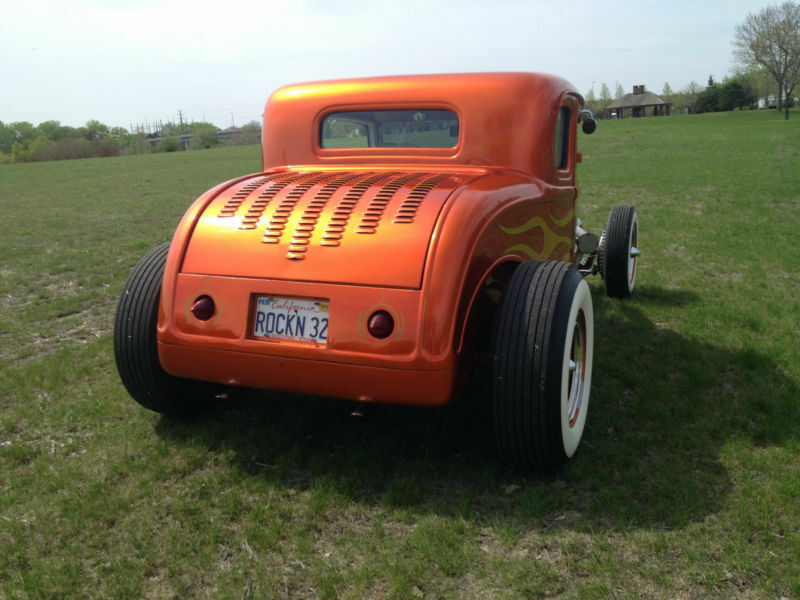 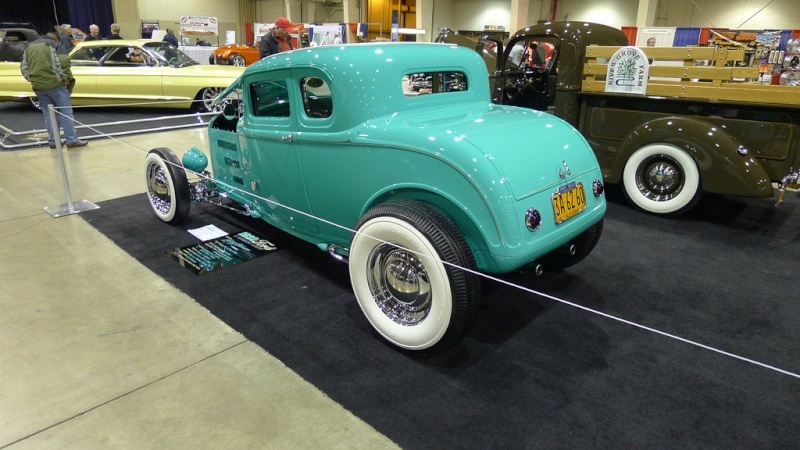 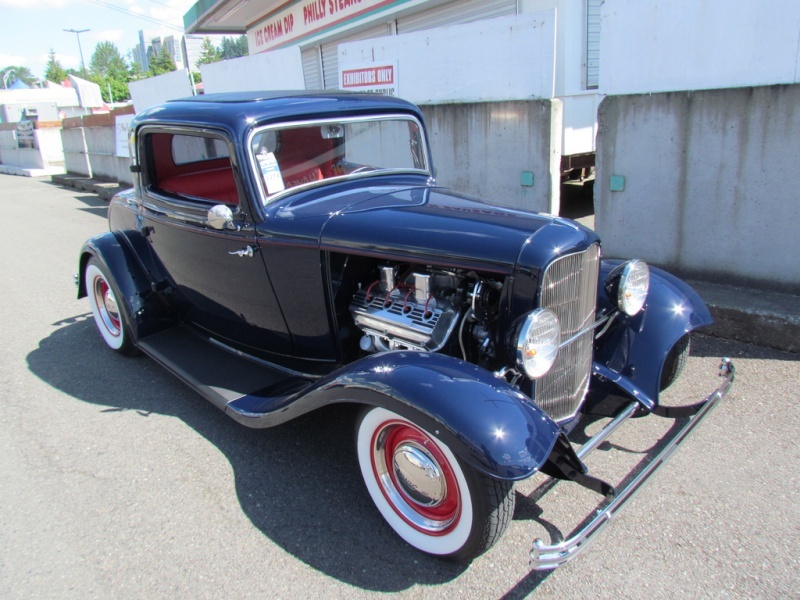 BODY: ORIGINAL FORD COUPE WITH FULL FENDERS & RUNNING BOARDS. 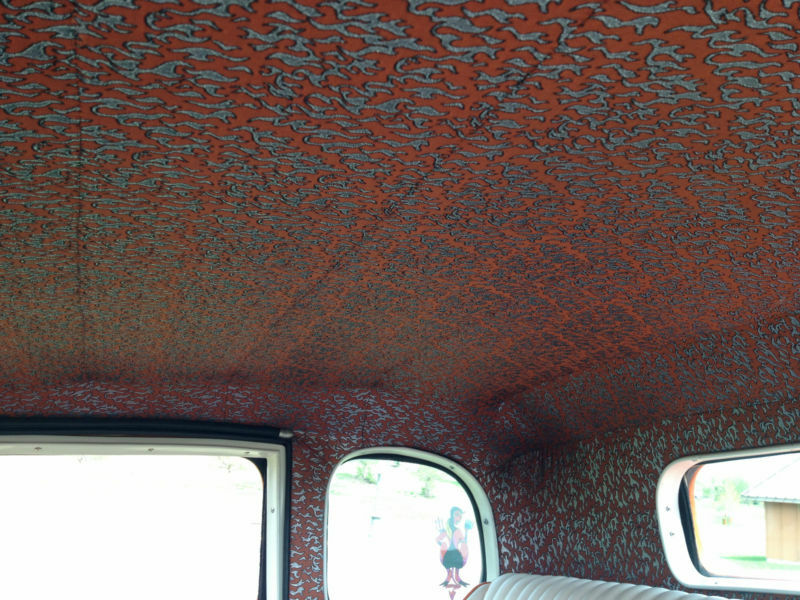 FLOOR & TOP INSERT REPLACED WITH NEW; FACTORY TRUNK & ROLL DOWN REAR WINDOW, INCLUDING ORIGINAL SHADE. 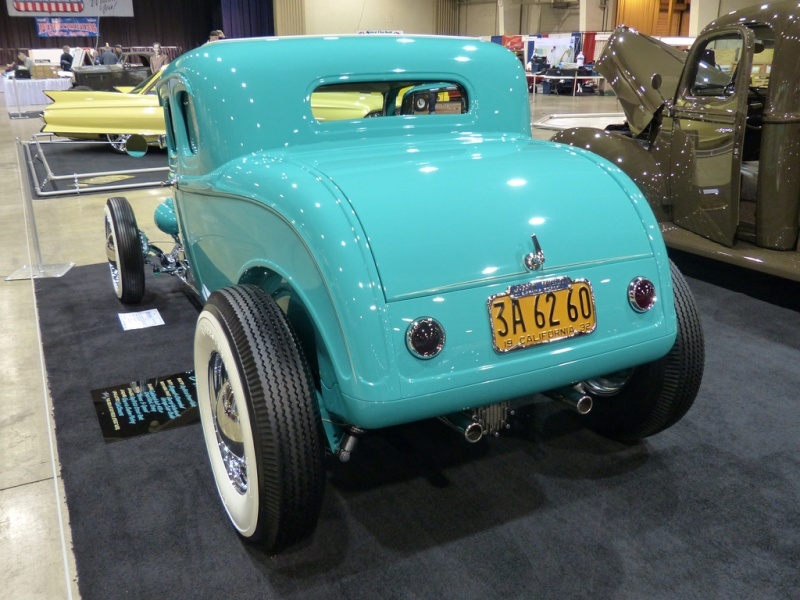 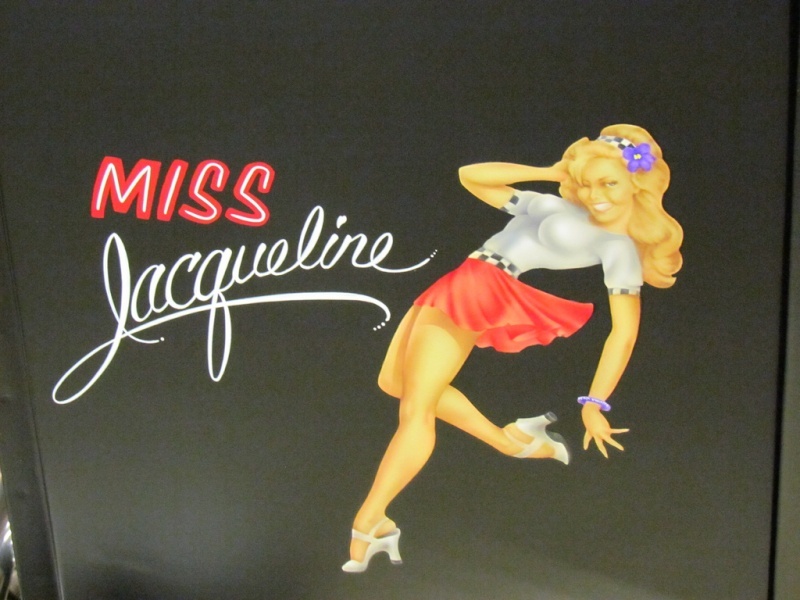 "SUEDE" PAINT IS URETHANE BASE/CLEAR COAT WITH FLATTENER TO RESEMBLE A PRIMER LOOK. 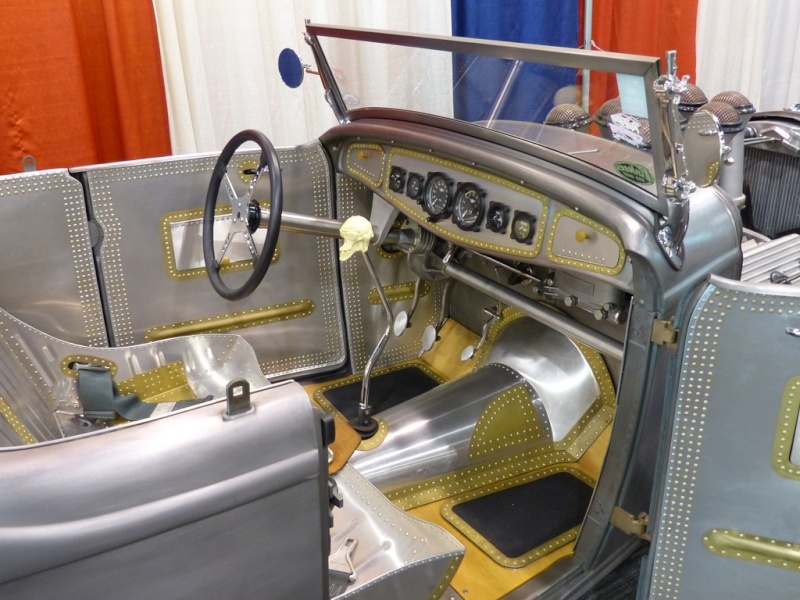 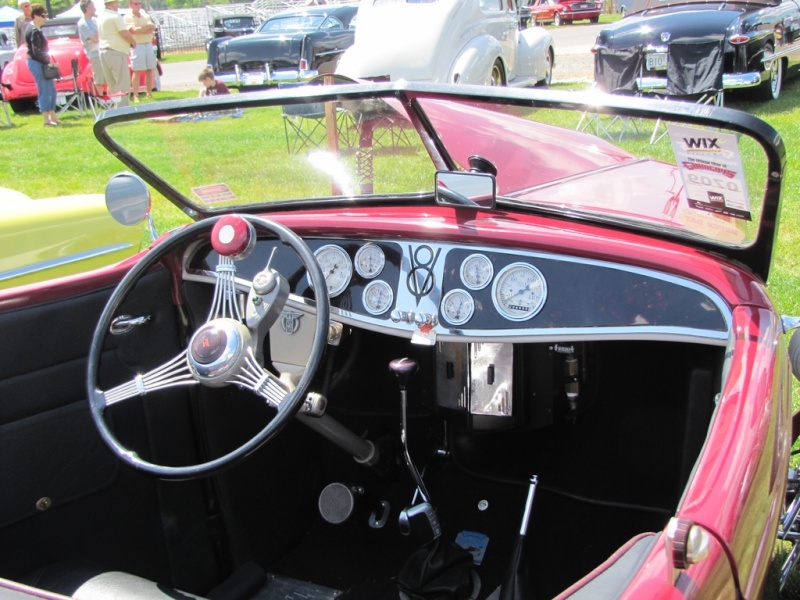 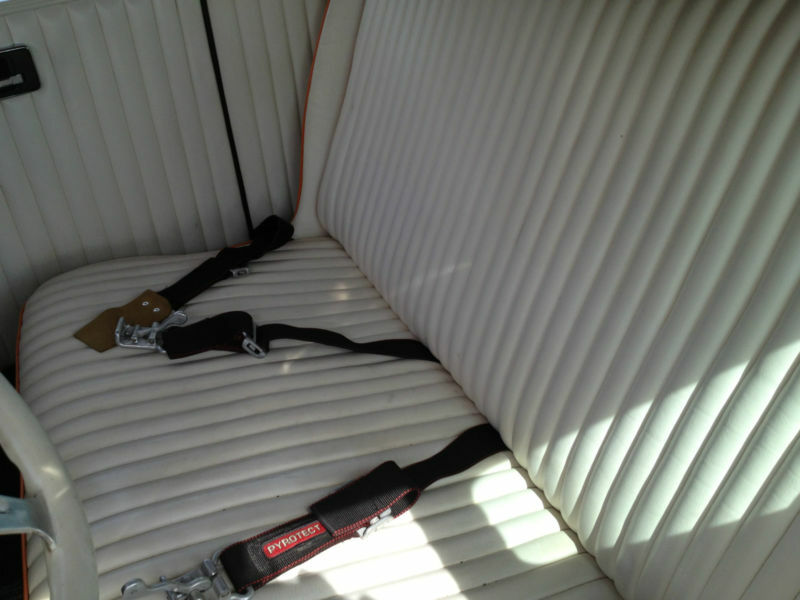 1932 FIBERGLASS DASH WITH 1932 NASH GAUE CLUSTER & IT'S ORIGINAL STEWART WARNER GUAGES CONVERTED TO 12V. 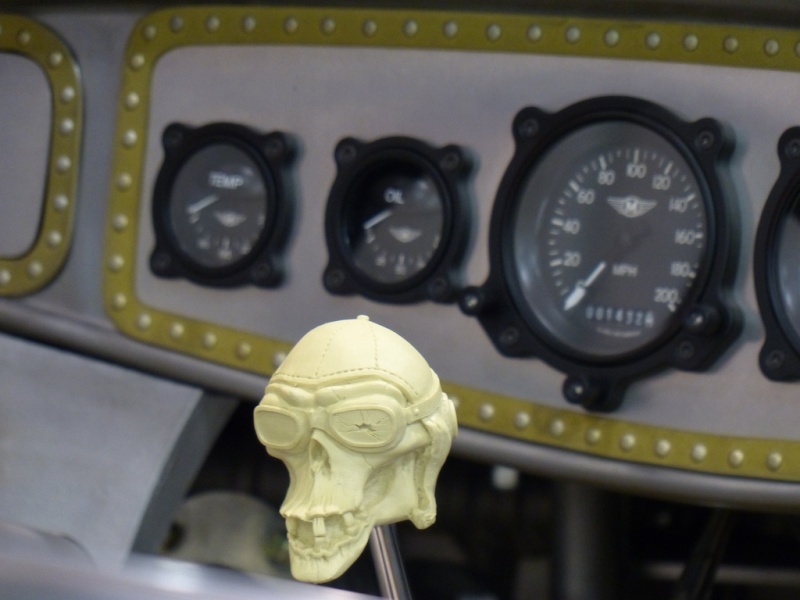 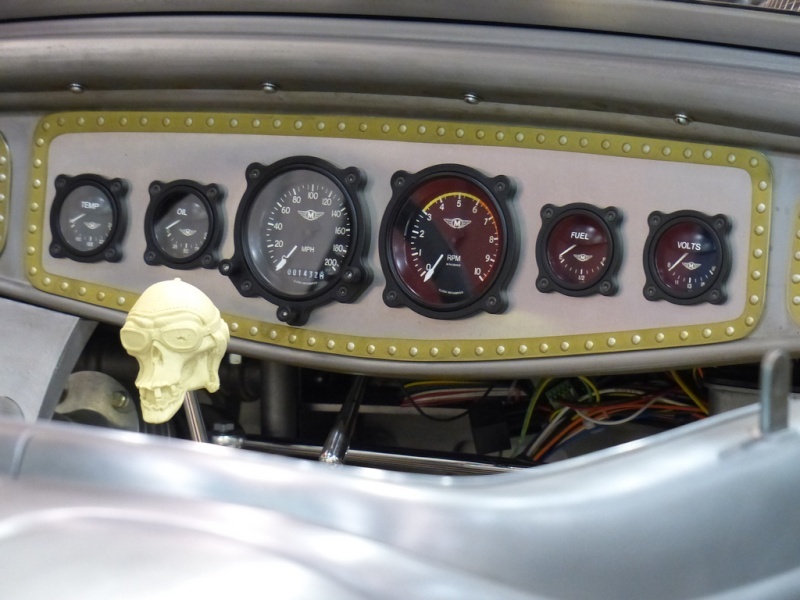 ADDITIONAL (MORE RELIABLE) GAUGES ON COLUMN ARE TRADITIONAL HOT ROD STYLE AUTO METER. 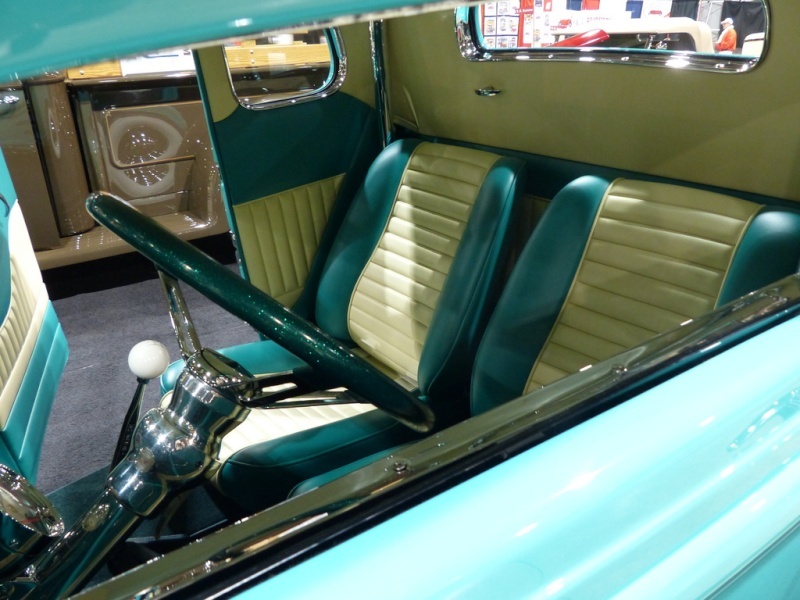 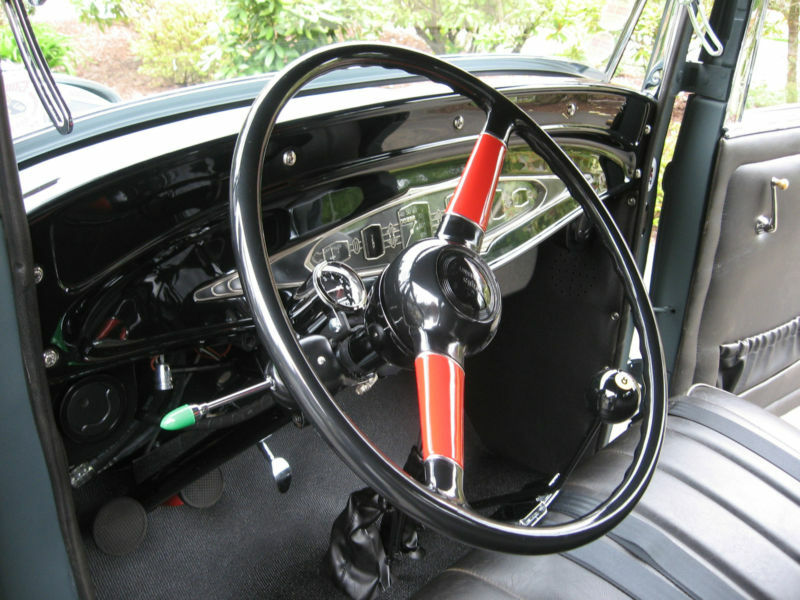 ORIGNALAL STEERING COLUMN W/1940 DELUXE FORD WHEEL. 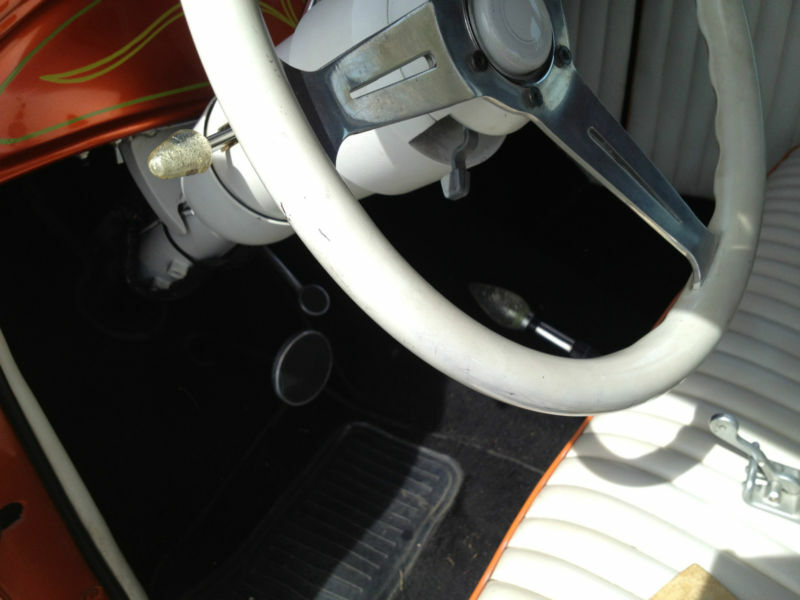 IGNITION WITH PULL KNOB STARTER. 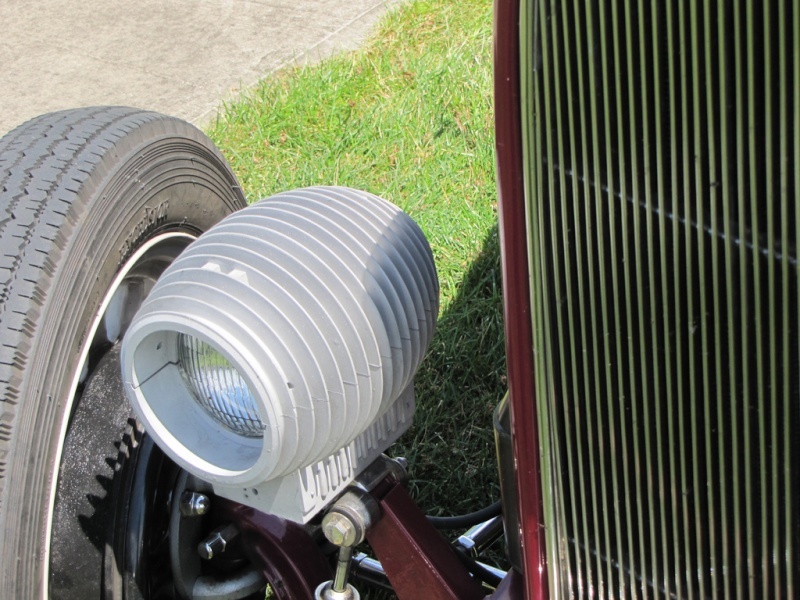 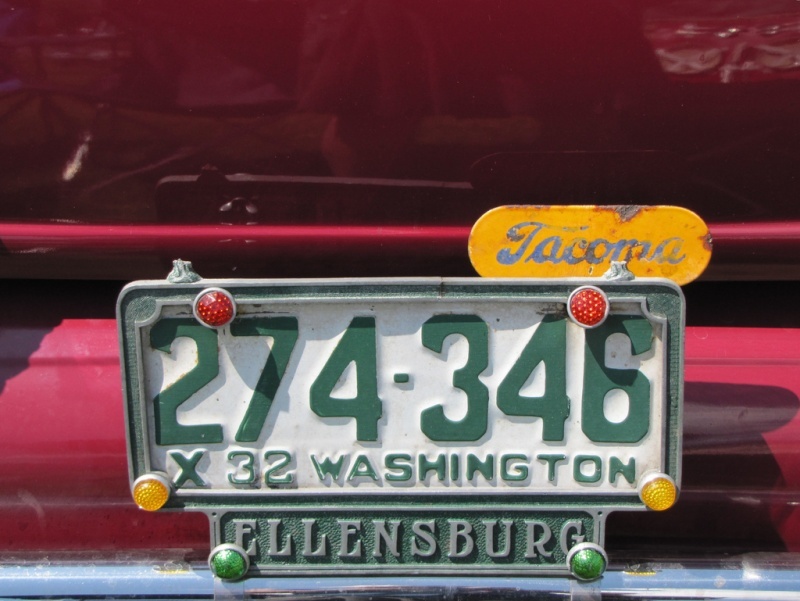 HIGHLY SOUGHT AFTER 1930'S ELECTROLINE 2200 HEADLIGHTS IN CHROME/PAINT COMINATION, BULLET STYLE CHROME SIGNAL LIGHTS. 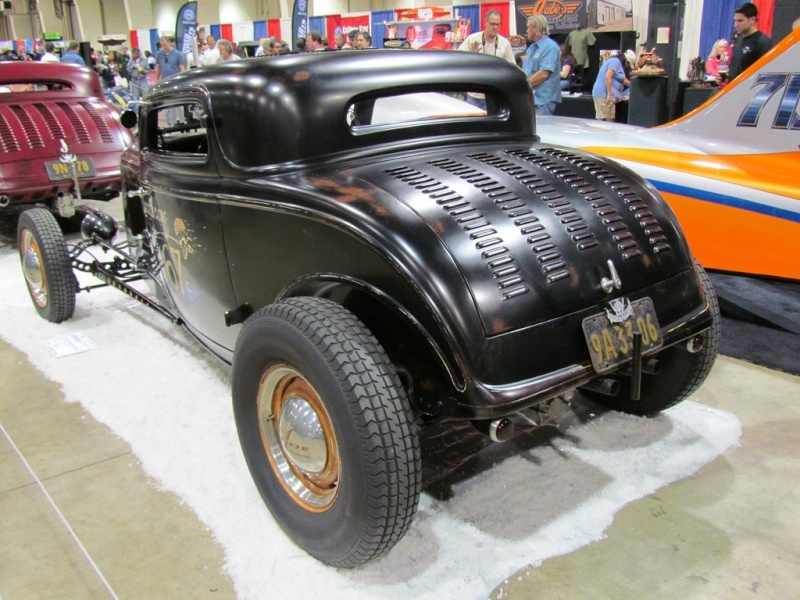 ORIGINAL FIREWALL PAINTED IN BLACK & WHITE CHECKERED PATTERN. 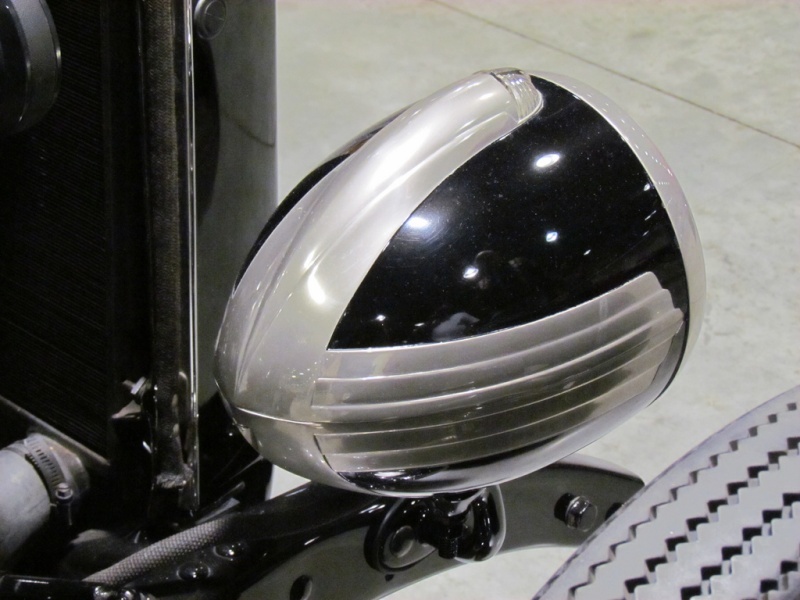 ALL FENDERS ARE RHINO LINED FOR PAINT PROTECTION. 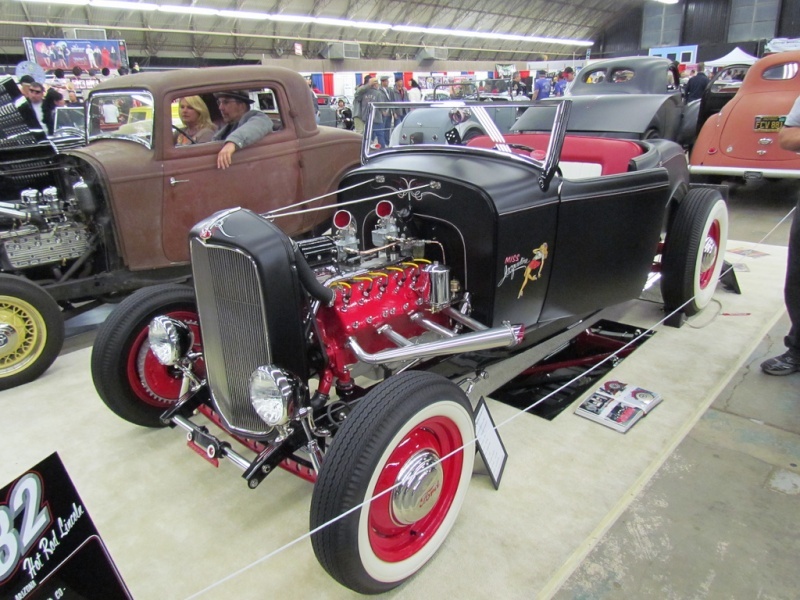 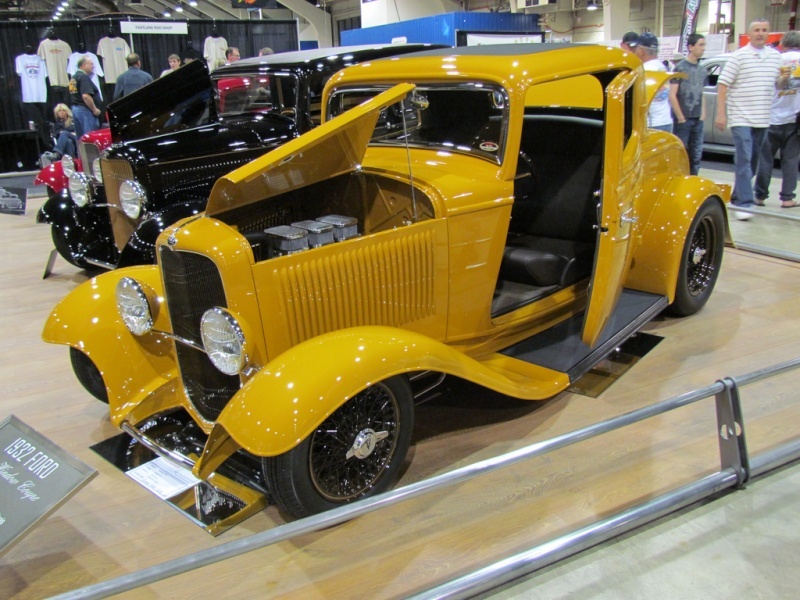 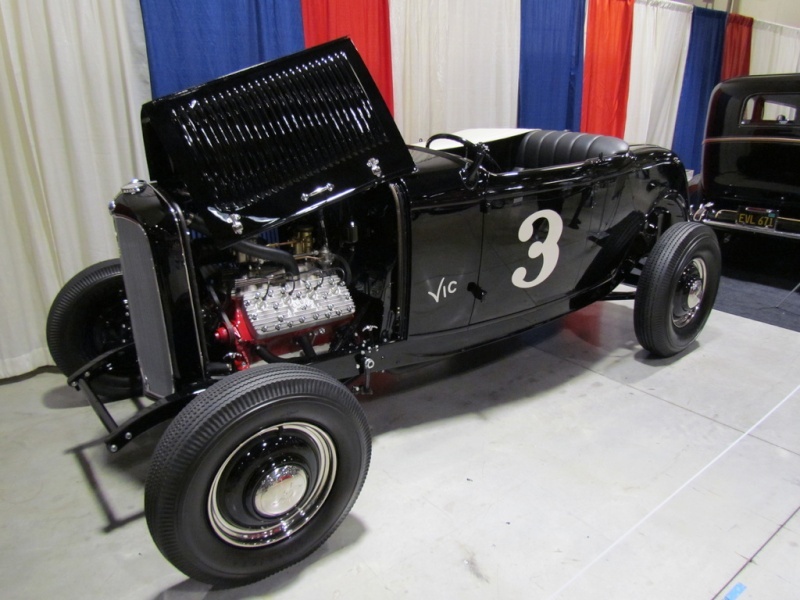 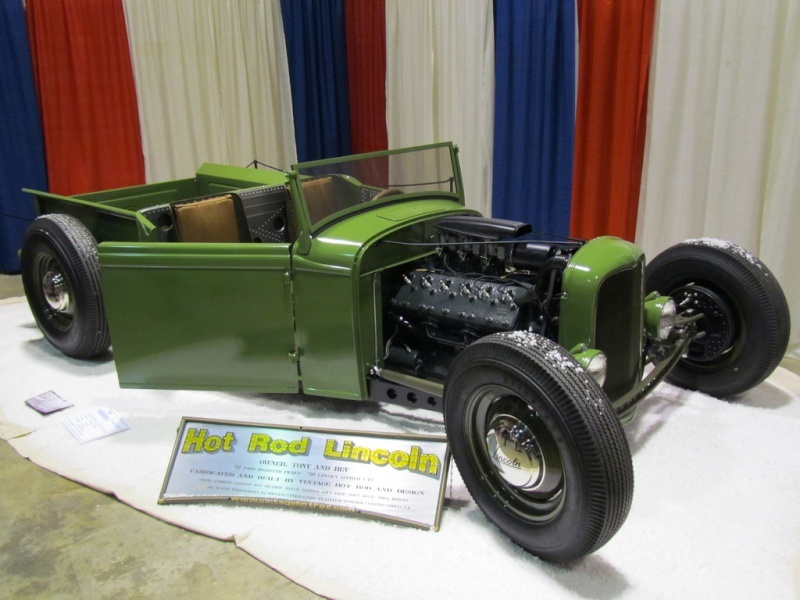 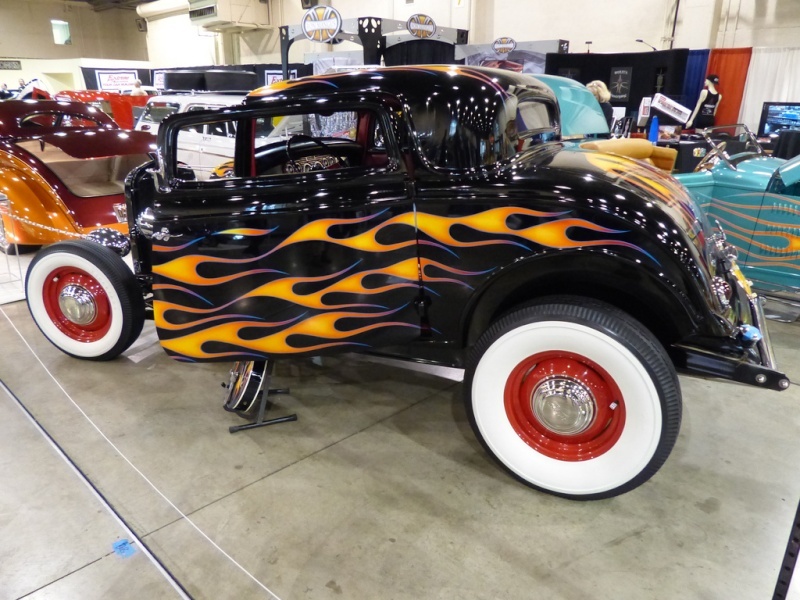 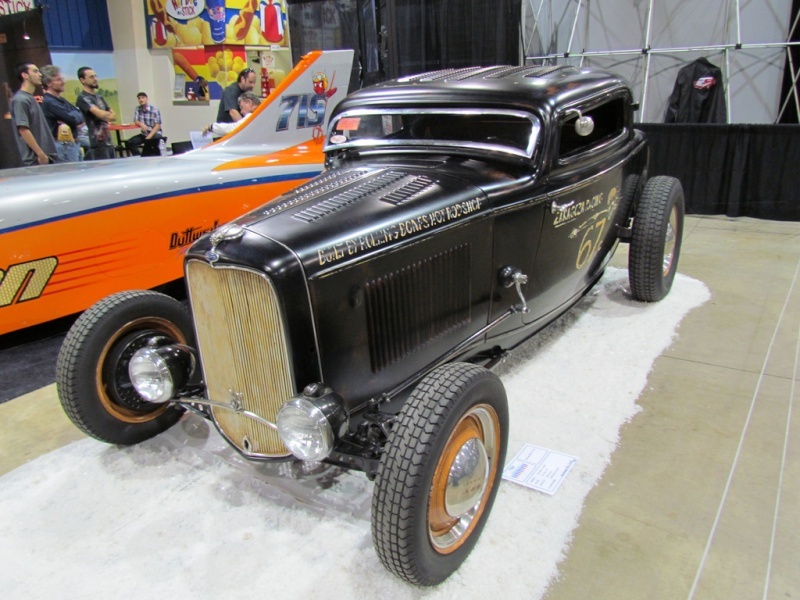 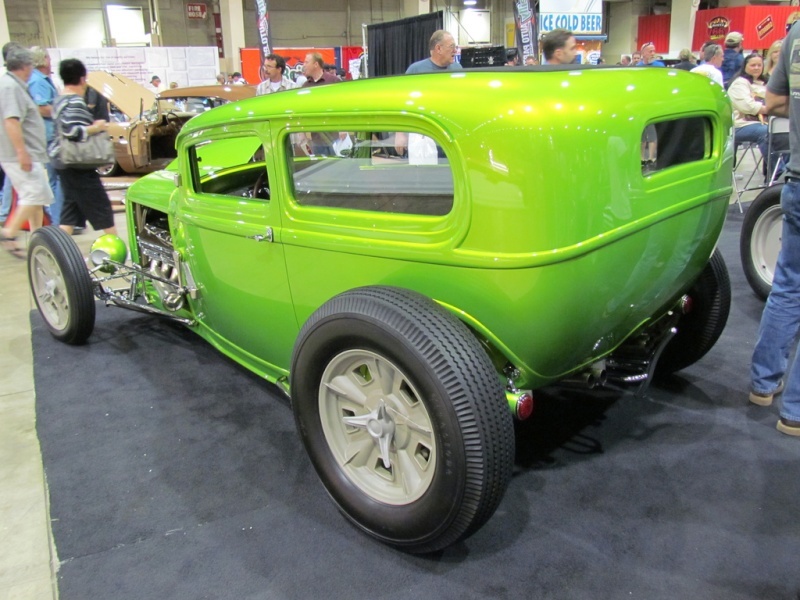 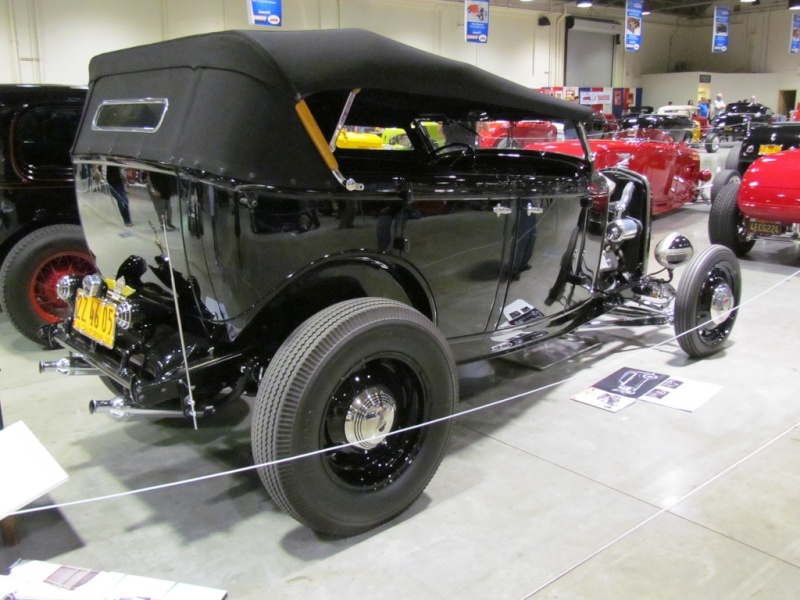 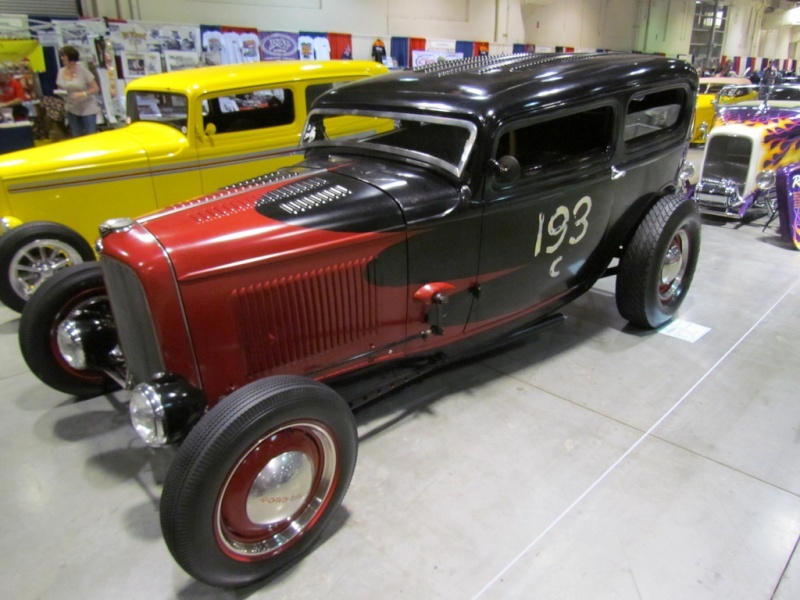 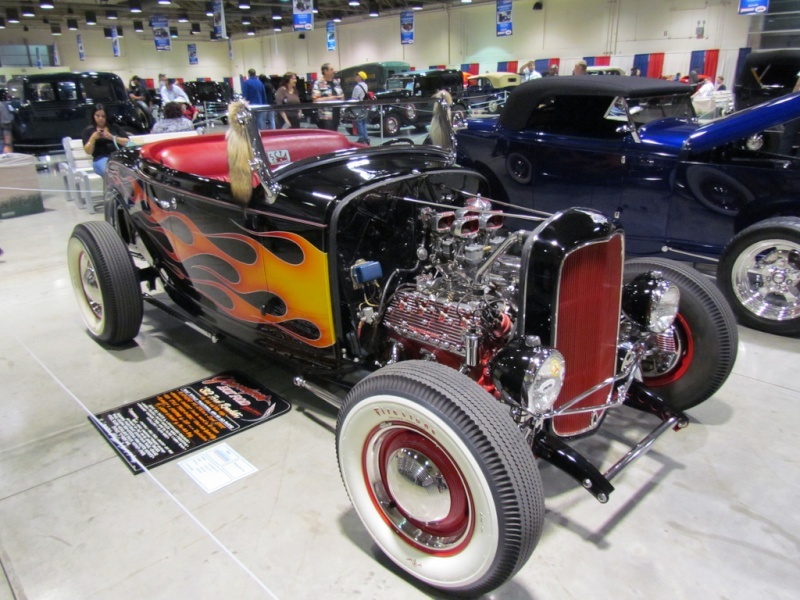 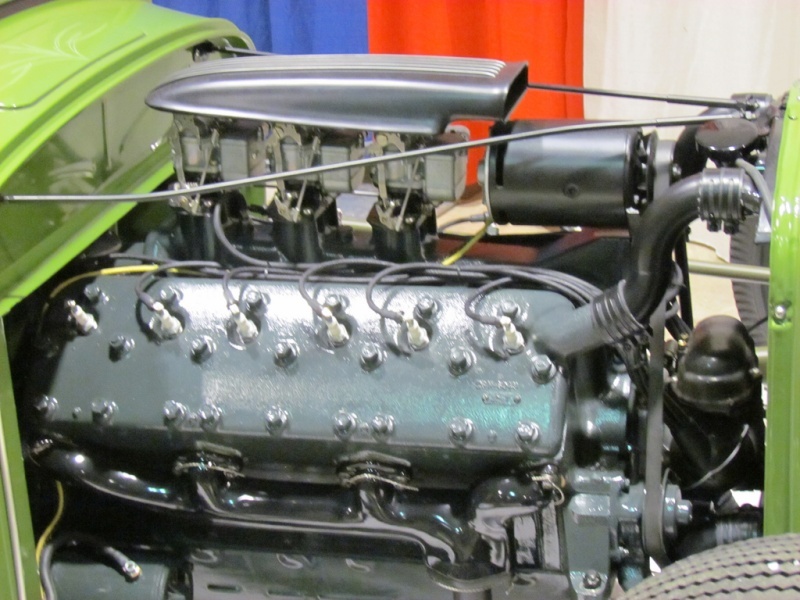 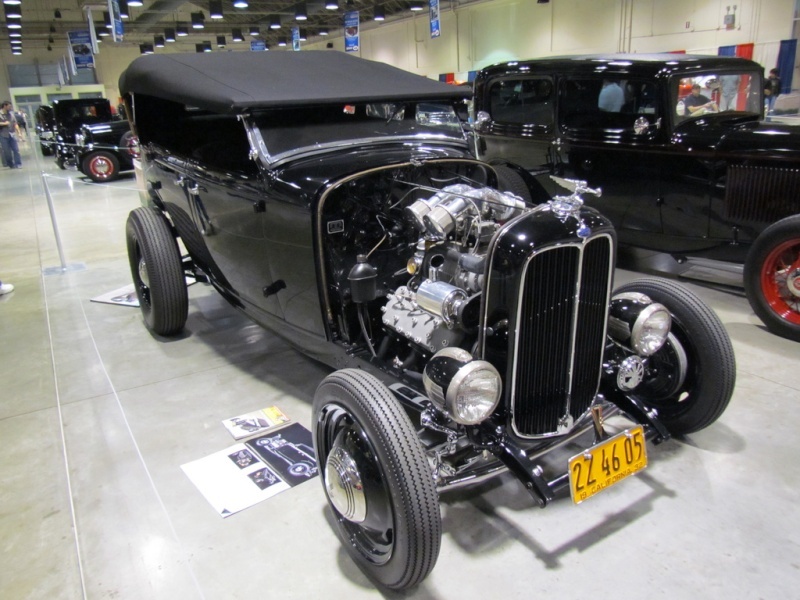 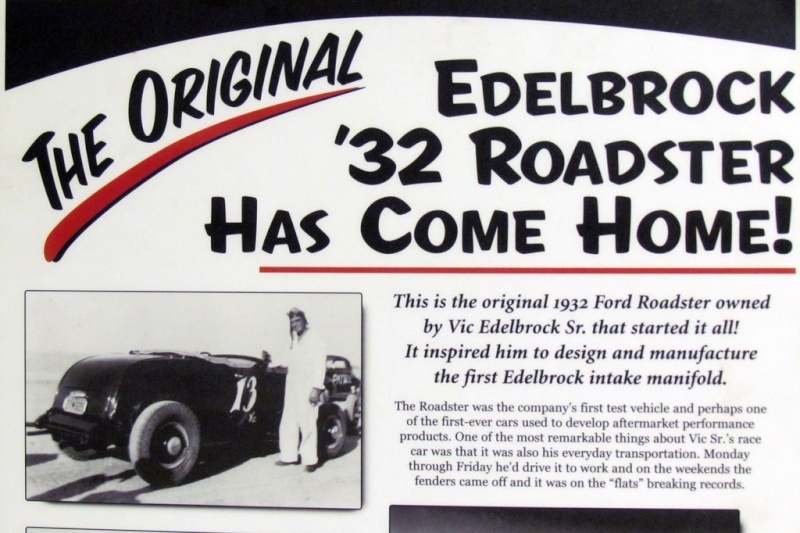 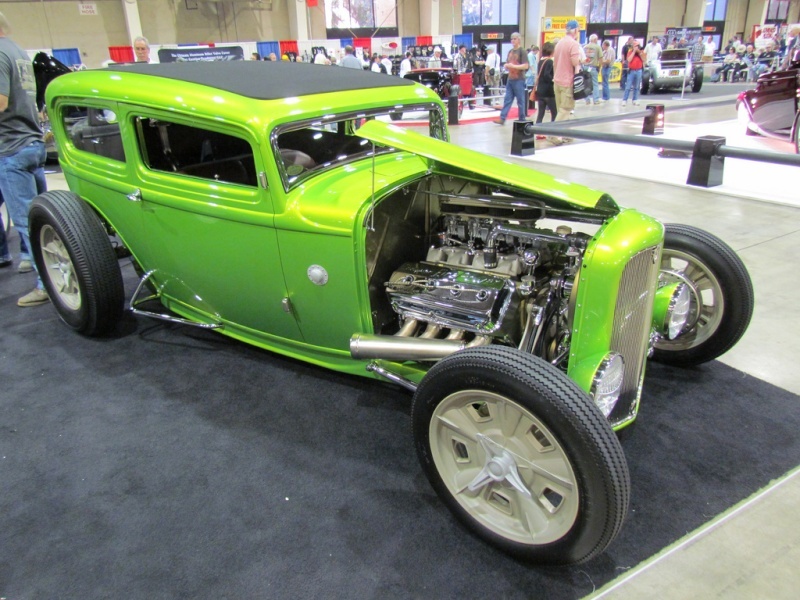 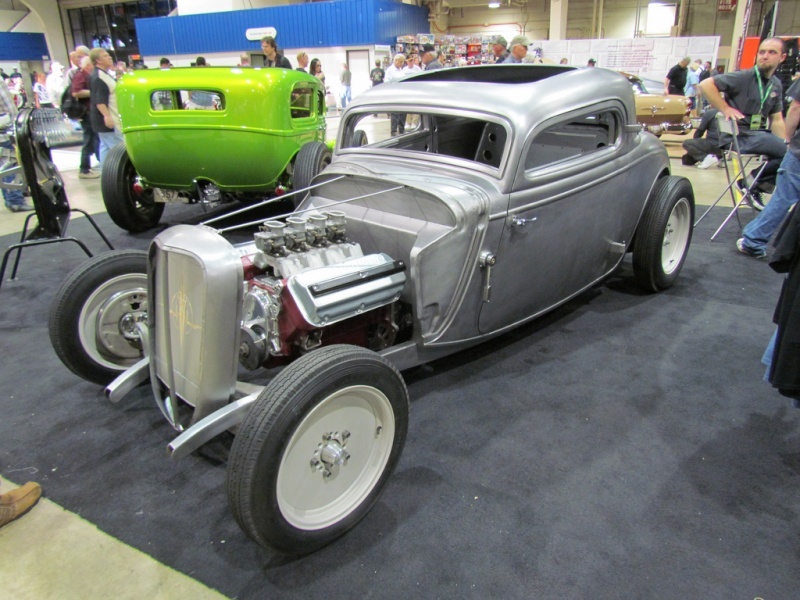 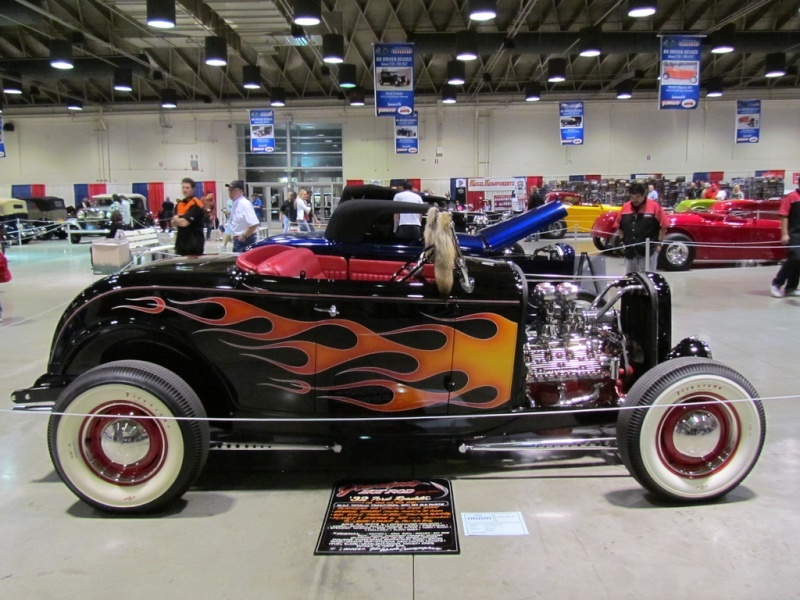 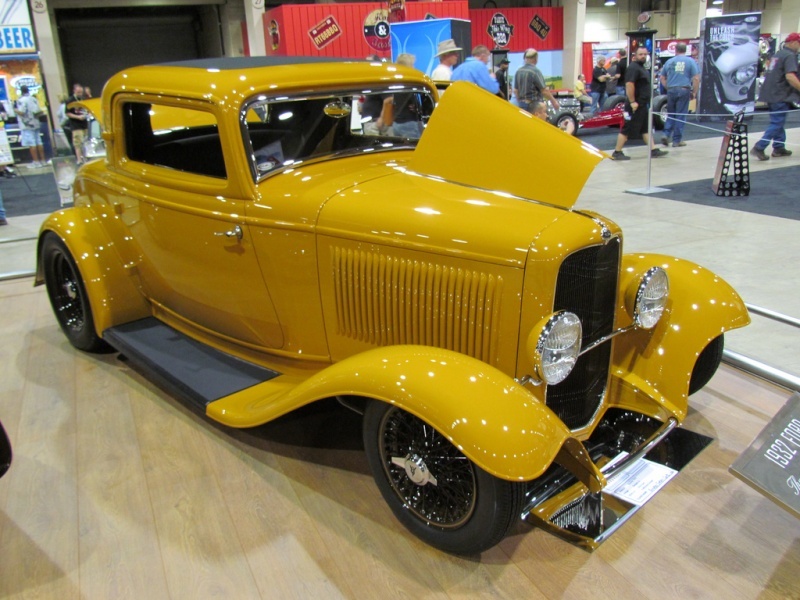 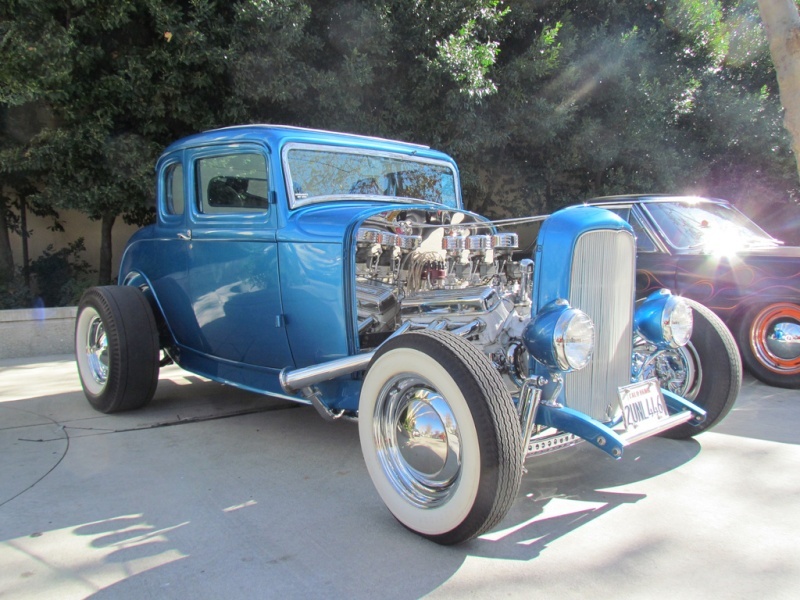 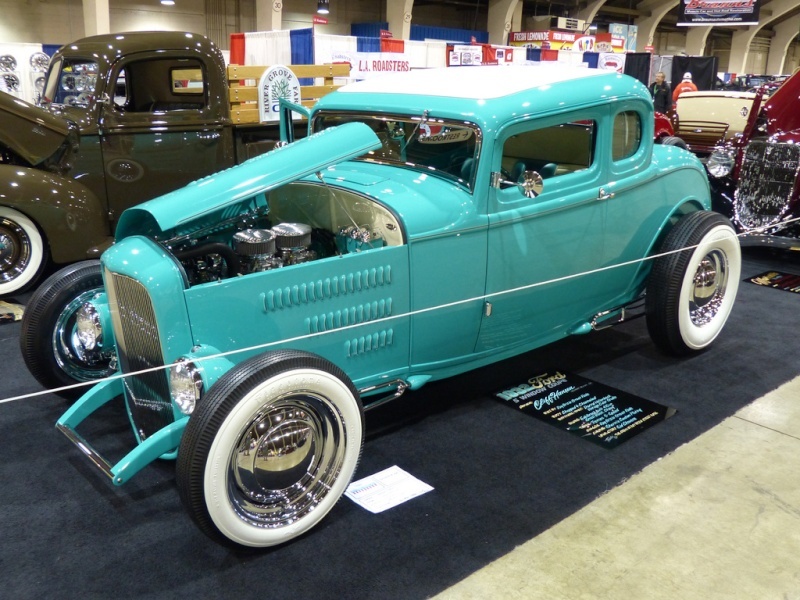 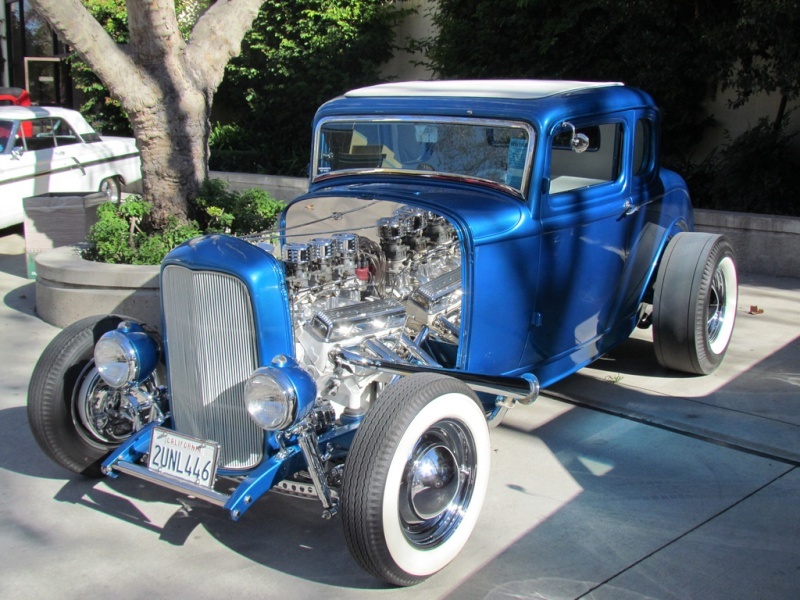 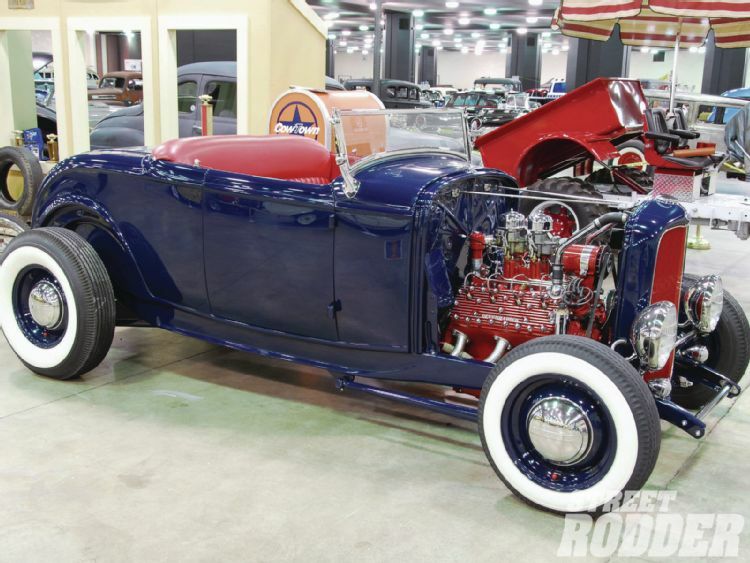 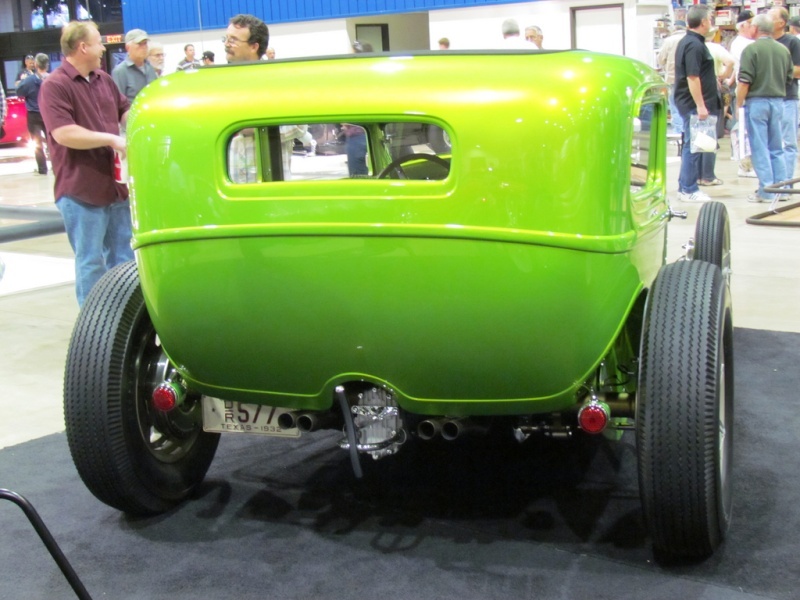 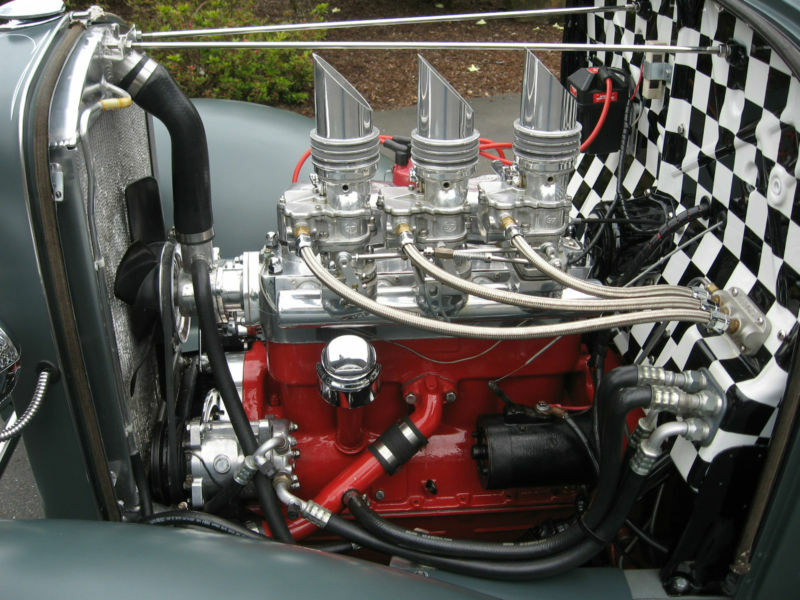 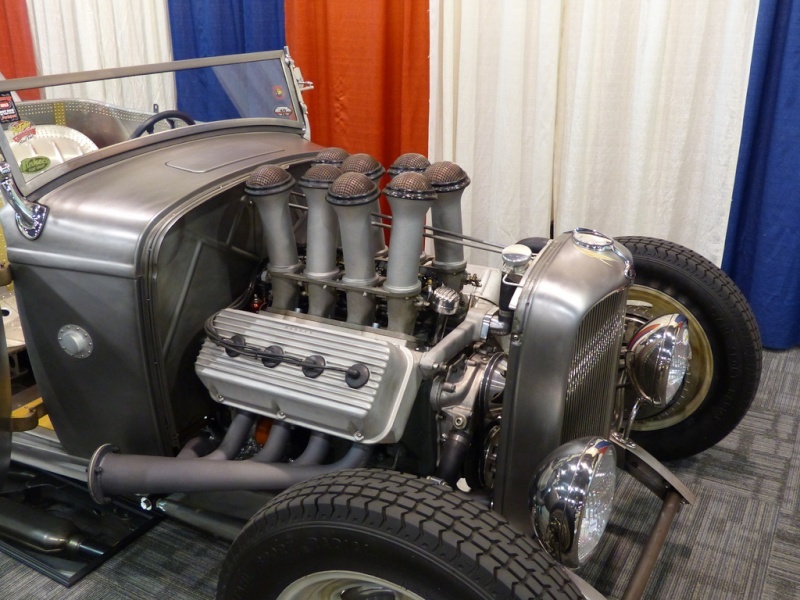 ENGINE: ORIGINAL NUMBERS MATCHING 1932 FORD MODEL-B 4 BANGER WAS REBUILT BY H&H FLATHEADS IN CA, FULL PRESSURE OILING & MAIN BEARING INSERTS; CROWER BILLET RODS & ROSS RACING PISTONS; RILEY 4 PORT OVERHEAD VALVE CONVERSION/160 DYNO TESTED HP. 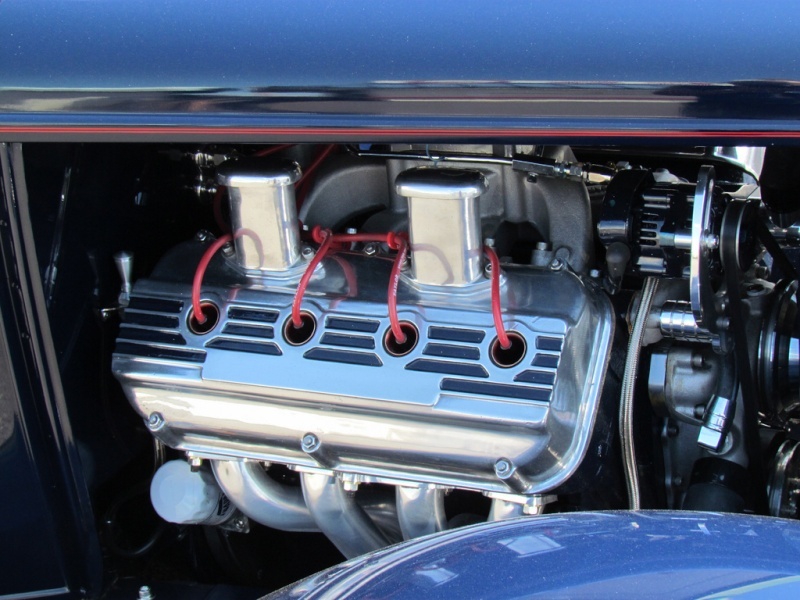 POLISHED ALUMINUM TRI-POWER INTAKE MANIFOLD W/3 CERMA COATED LARGE LOGO STROMBERG 97 CARBS & MAUND STACKS; HAND BUILT CHROMED PROGRESSIVE LINKAGE. 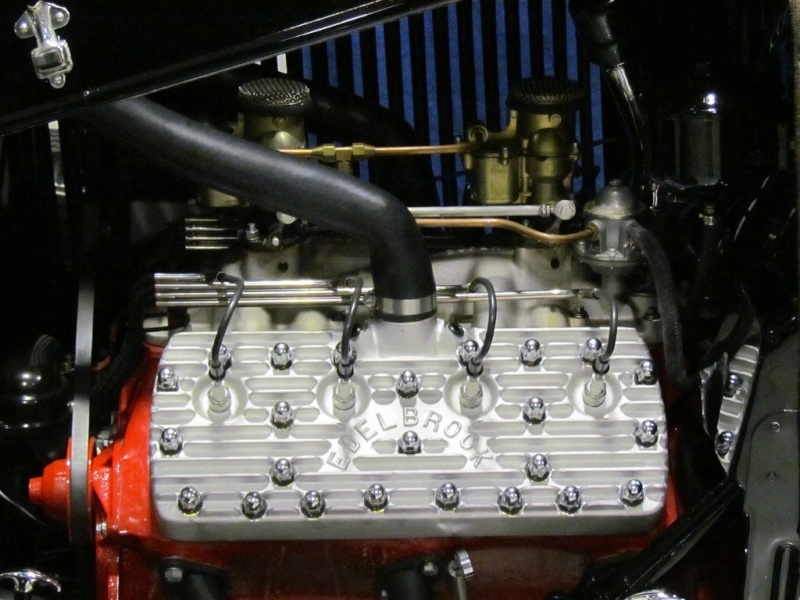 MALLORY IGNITION COMPONENTS W/PERLUX IGNITER. 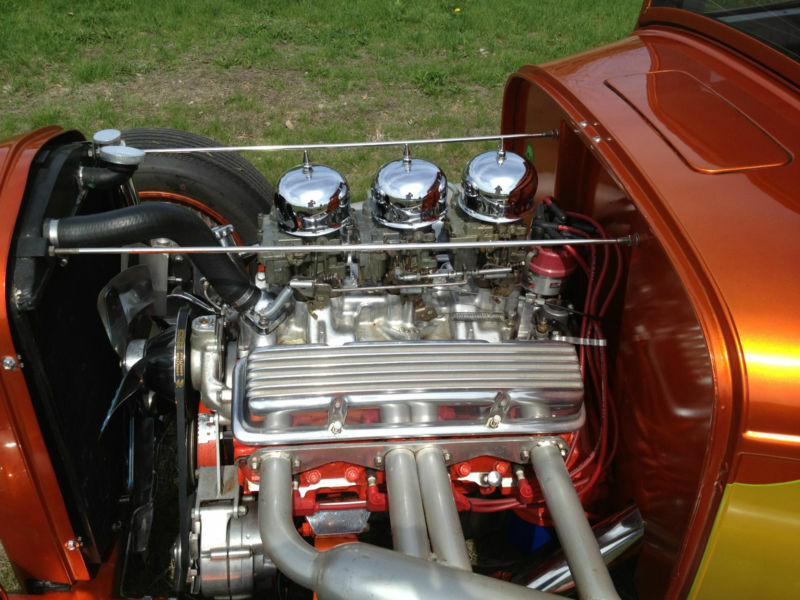 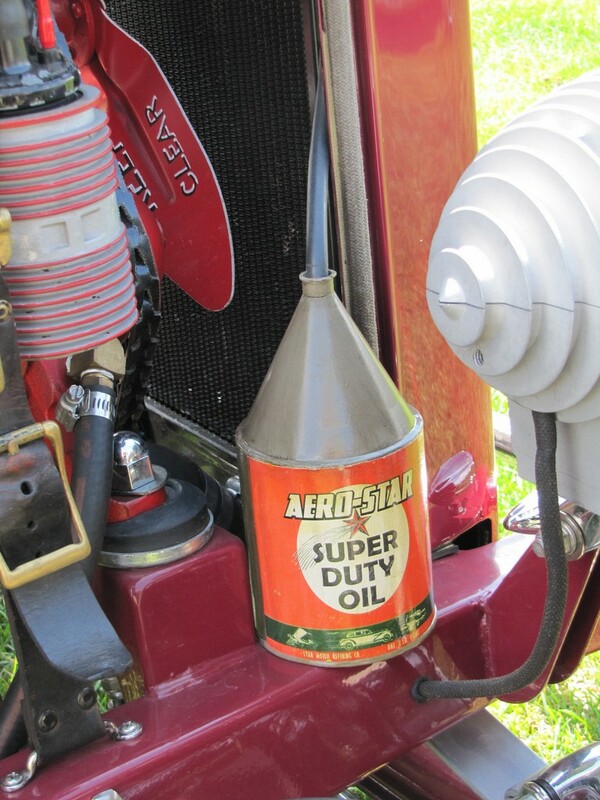 CUSTOM WATER PUMP, FAN & RADIATOR; 100 AMP CHROME ALTERNATOR; ORIGINAL STARTER REBUILT. 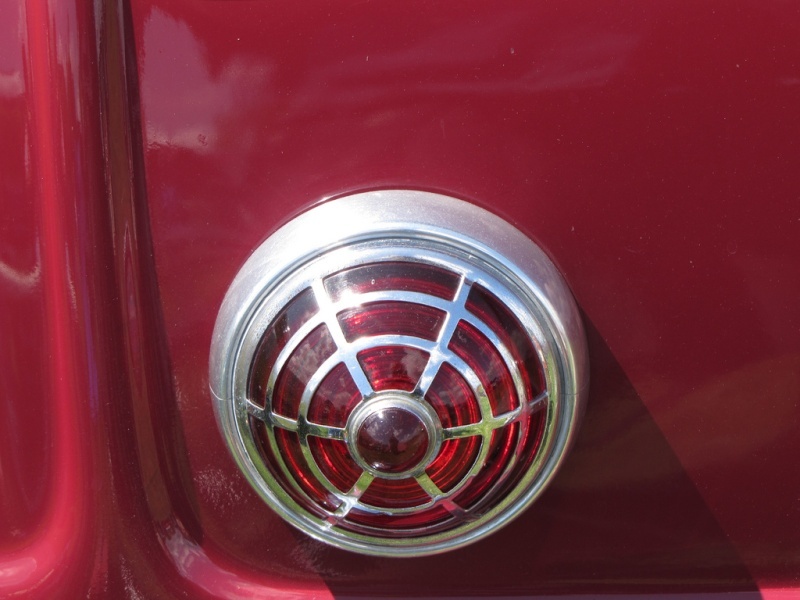 VINTAGE AIR HEAT/AC. 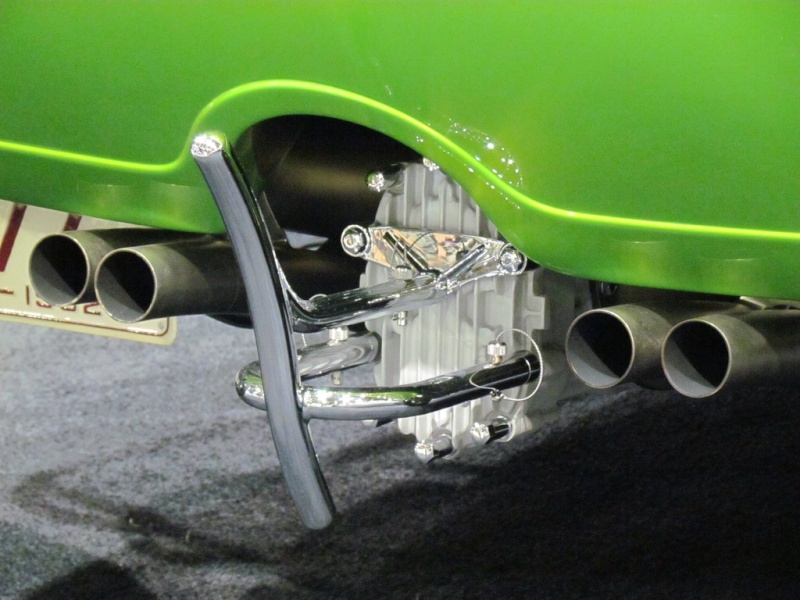 CUSTOM MADE STAINLESS STEEL & CERMA CHROMED EXHAUST HEADER. 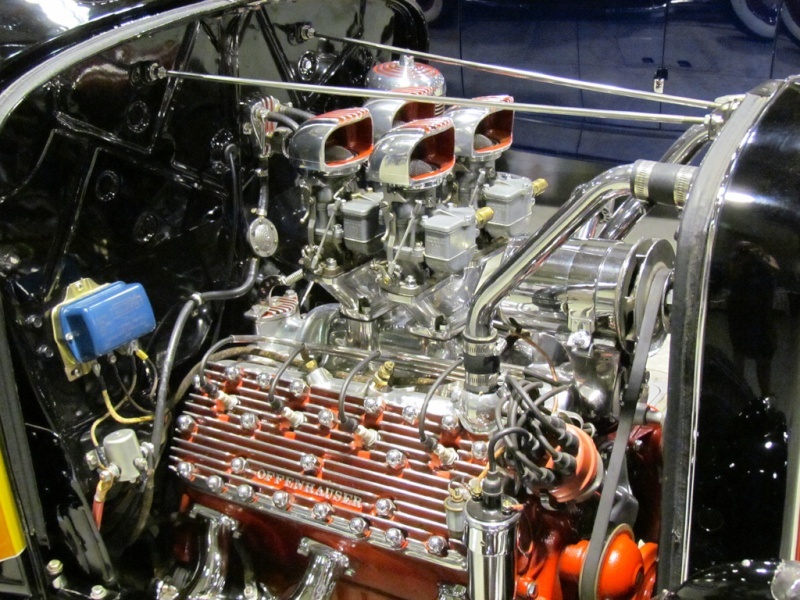 ENGINE & COMPONENTS ALONE ARE OVER $17,000. 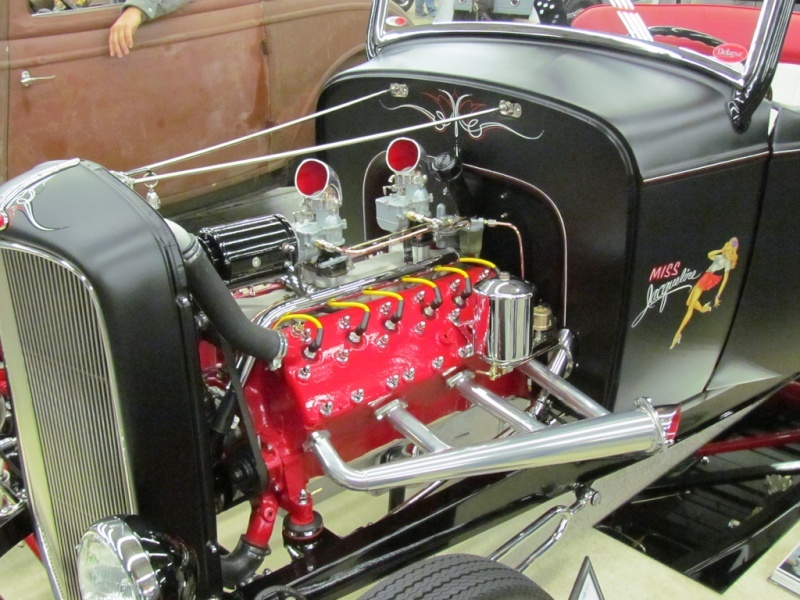 CHASSIS/DRIVETRAIN: ALL ORIGINAL SPLIT WISHBONE & POWDER COATED IN RED. 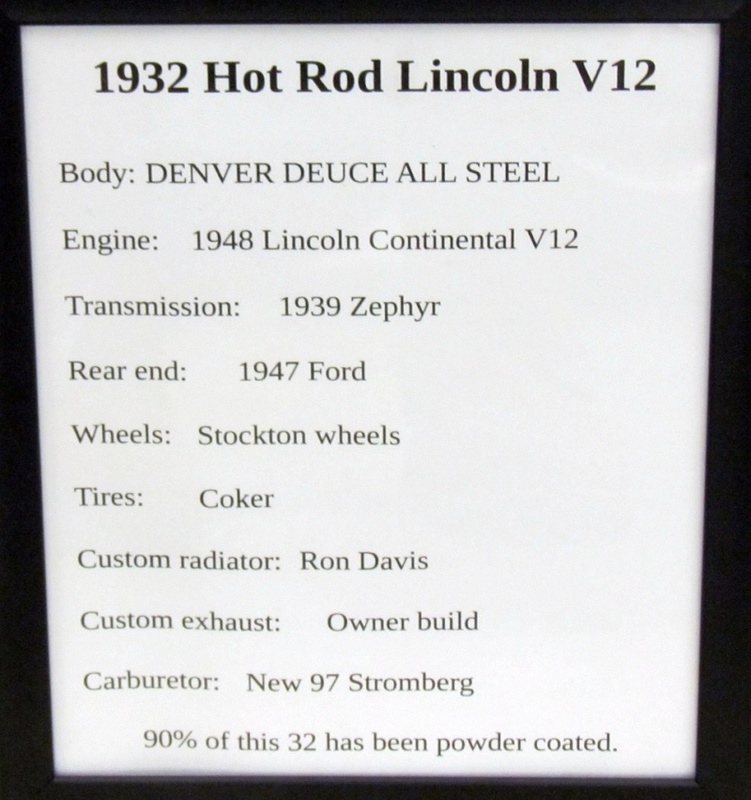 1940 FORD REAR END W/BORG WARNER OVERDRIVE IN TORQUE TUBE (HAVE NEVER CONNECTED THE OVERDRIVE); ORIGINAL 3 SPEED ON THE FLOOR TRANSMISSION W/MID 40'S GEARS; ORIGNAL SHIFTER; CHROME E-BRAKE; HYDRAULIC BRAKES-FRONT 53 FORD F-100 TRUCK, REAR 40 FORD PASSENGER CAR; 1939 FORD MASTER CYLINDER. 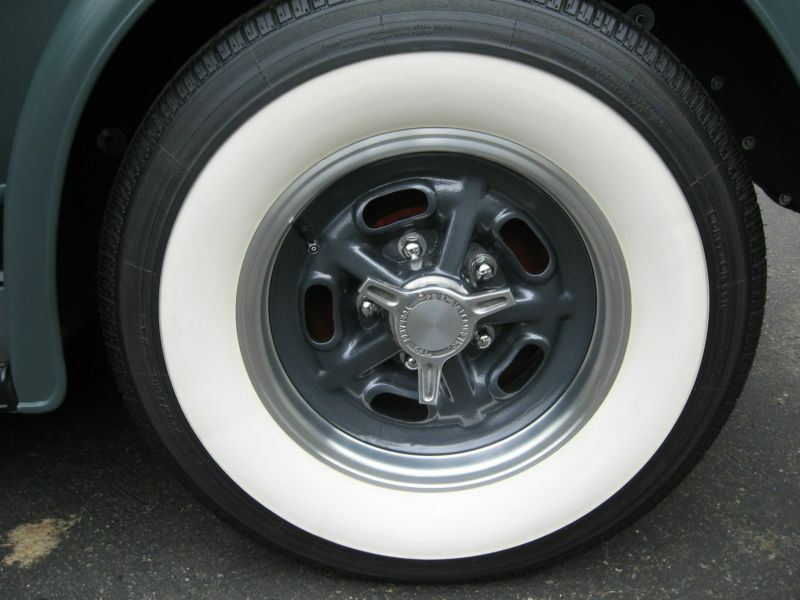 PSE KIDNEY BEAN WHEELS W/CLASSIC COKER BIG & LITTLE WIDE WHITE RADIAL TIRES. 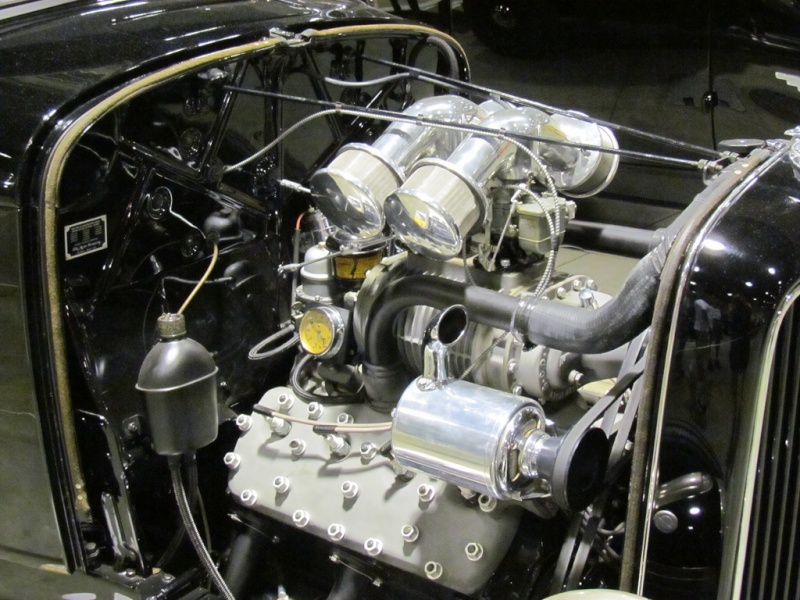 » "Genève en 1932 !!"